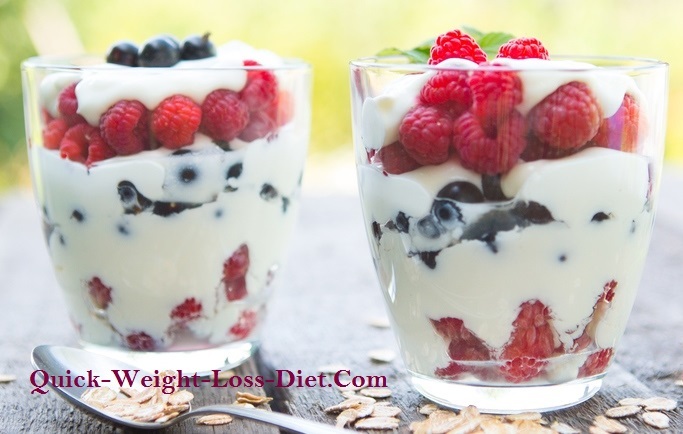 Quick Weight Loss Diets, Tips, Ideas, Diet Plans and More! 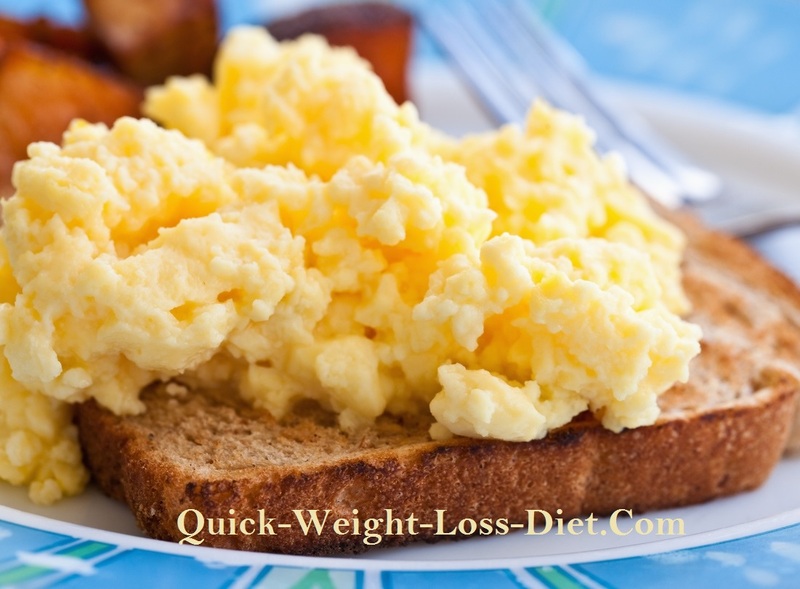 Welcome to quick-weight-loss-diet.com the home of quick weight loss diets, tips and ideas for safe, permanent weight loss. Before I start, please be aware this site does not offer recipes. So, if you're looking for recipes of any type whatsoever then you're in the wrong place. If, on the other hand, you're looking for ways to lose weight quickly or slowly, or you want to get fit and/or healthy on the inside, then you're in the right place. Also, some pictures of some of the meals on this site may look a bit rough around the edges so to speak? That's because many of them are taken by me of my meals and/or my kid's meals before we ate them, so they aren't sourced from a professional photo gallery like many health or diet sites. That's not to say some of the pictures aren't sourced though as some are, but many are taken by me. I'm a real person writing this site alone based on how I eat and have done for most of my life, so the vast majority of this website comes straight from me, Paul Chislett. And, if there's anything I'm not sure about, I research it properly before writing about it. Some quick weight loss diets are quite restrictive with others extremely so. This means they can be very taxing on the body. This is when things are potentially dangerous particularly for older and weaker individuals. I have therefore listed these quick weight loss diets and methods in order of easiest on the body first. Before starting any quick weight loss diet here or anywhere else on the internet, please read about detoxification first to help you to understand the various levels of detoxification and what you can expect during such times. Safety is paramount! There's a long list of quick weight loss diets, methods and techniques available and many will be listed here in due course. Slower methods of weight loss will also be discussed including various diet plans for health, vegetarianism and detoxification, plus lots more tips and ideas on various aspects of diet and exercise. I've personally practiced every single diet here at some point in my life, not to lose weight, but to get cleaner internally and healthier. It just so happened that I lost a lot of weight while on these diets which is why I've decided to write about them. Finding the right type of diet for YOU can often be confusing and a matter of trial and error. This website will hopefully help to make things a little easier for you by giving you plenty of choices to choose from and try. These will all be added to in the coming weeks, months and years so please keep coming back, thank you. 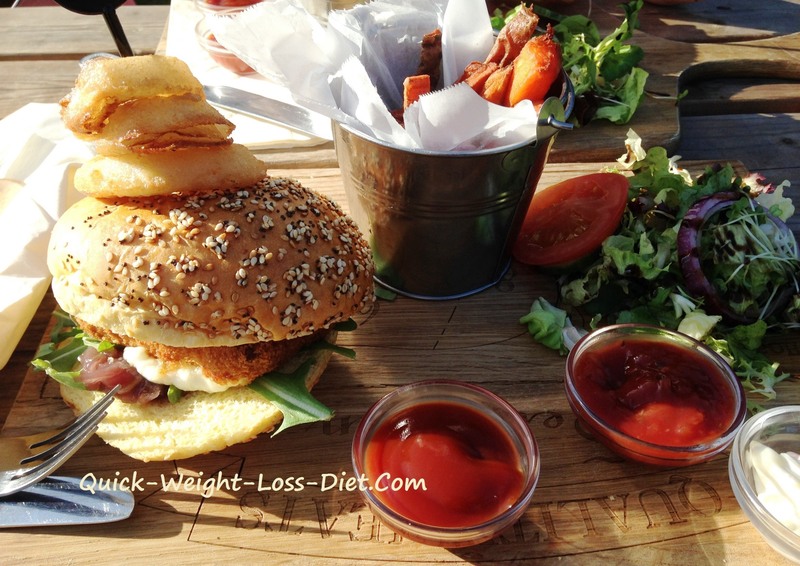 Many people think quick weight loss diets are unhealthy and possibly dangerous? Well they can be if for example you just stop eating with no thought or consideration to your previous diet, your physical health and any medical conditions that you may have. To lose weight quickly and safely requires some self-assessment on your part, which in all honesty isn't really that difficult. Basically speaking, you have to be in relatively good shape to be able to make the switch to some of these diets as they can be very demanding on the system as they will encourage a gentle detox. It depends on various things such as; your previous and existing diet, your age, your lifestyle and whether you're on any medication etc. If you have any concerns or are in any doubt about starting any type of quick weight loss diet then please speak to your medical doctor first. Many people believe if you lose weight quickly you can also put it back on again just as quickly thereby creating a cycle of what is known as 'yo-yo dieting' where your weight continually goes up and down through a vicious circle of dieting and binge eating. Although there is some truth in this, I also believe it comes down to the individual and whether or not they're able to make long-term changes to their diet to keep the weight off permanently. Having said that, if you're the type of person that has suffered from yo-yo dieting in the past, then losing weight a little more slowly may be the answer. In fact, I personally believe it's better overall to spend time on each phase of a 'quick weight loss diet plan' to allow your body and mind time to adjust to the new eating routine. The quick weight loss diets on this page are in the order they are for this very reason, to prepare your body slowly for the radical change of each dietary phase in a progressive way. This is also discussed in detoxification under the sub-heading Detox inducing methods: (least aggressive first). The good thing about any quick weight loss diet is you will obviously see quicker results. This is far more encouraging to many people than a slower approach where you might only lose one or two pounds a week for example. Many people who start these types of ‘healthy diet plans’ for weight loss can become discouraged at the very slow rate at which they lose weight. As a result, many give up and go back to their old eating habits. Having said that, it is also true that a more gradual approach is more appropriate for some people. It's all about personal choice and what YOU feel drawn to. 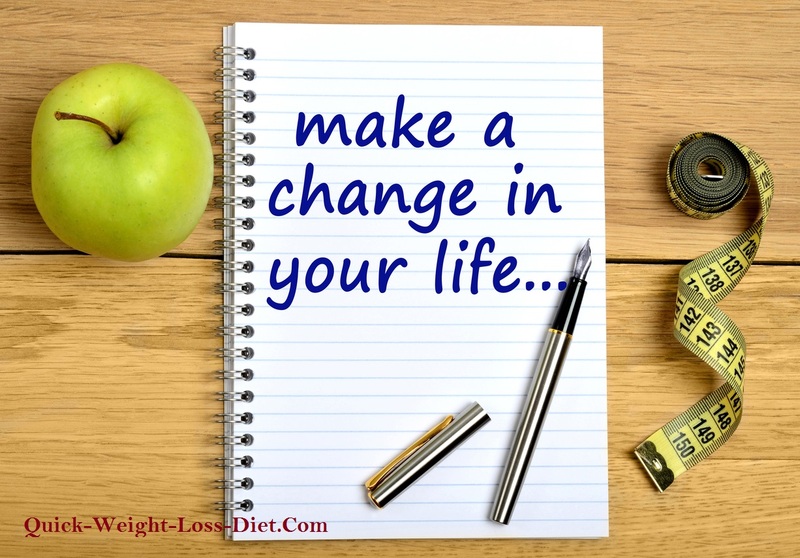 If you take a good look through each of the diets and their meal plans listed further down, you'll instinctively know what you can and can't do. Our instinct is a very powerful tool for making decisions if only we can listen to it a little more, although it does also have to be backed up with a certain amount of good, sound knowledge of course! 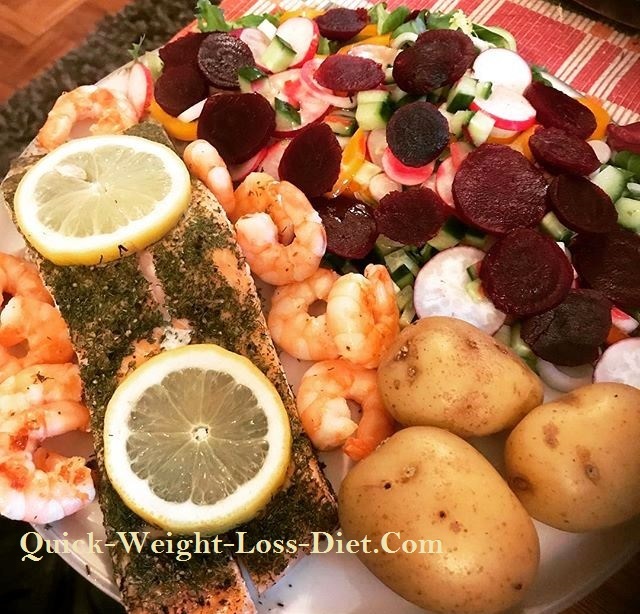 Quick weight loss diet #1 focuses on speeding up your metabolism, and although you can lose weight quickly with this diet it does have a slower approach to weight loss than the other diets that follow after. This makes it ideal for those looking for a slightly slower approach to losing weight. This first diet is a fairly easy diet to start with and should pose no real problems for most people as it allows plenty of meals with lots of variety. After spending a few weeks or more on that particular diet and its meal plans you can then move on to the second quick weight loss diet and start to slowly incorporate that alongside the first if you want to. This will speed up weight loss further. This approach of spending time on the first diet allows you to slowly adjust physically and mentally to the dietary change and prepares you further for the slightly more demanding diets that follow. This is a sure path to safe weight loss in the shortest possible time for YOU. Once you're clean enough internally by spending time on the first diet, you’ll be able to step it up to the more aggressive quick weight loss diets and methods where you can lose weight rather quickly, but more importantly, SAFELY. Well this is something nearly everyone wants to know. We all want the thing we seek as quickly as possible, whatever it is we’re after. What impatient creatures we sometimes are. The speed at which a person can lose weight varies for different people but the plain truth is the more weight you're carrying around, the quicker you will lose weight once a significant change of diet is started. This is because, when you're carrying a lot of extra weight, that in all honesty shouldn't really be there, it's just waiting to fall off and it does so rather quickly when given the chance! Adding a gentle exercise routine will help to speed things up. Quick weight loss diets vary in their meals and methods but they all generally have certain things in common, or should do in my opinion. They should all contain plenty of fibre and they should all have a gentle laxative effect on the body, meaning they should not be constipating to the system in any way. This is very important because when we start to eat a cleaner, healthier diet a gentle process of detoxification occurs. The strength of the detox depends on how 'clean' you start to eat as well as other factors such as previous and present diet, age and physical constitution/weaknesses/strengths etc. Toxins will start to accumulate in various places but particularly the lower end of the alimentary canal, namely the colon or large intestine. We want the toxins to leave the body as quickly as possible which they will do if our diet is mildly laxative. A healthy colon is a healthy body! This is my take on things so please don't think I'm suggesting I know you or anybody else. That said, I believe people become overweight from any combination of many different factors. I also believe, by becoming aware of these factors it will help you to change them over time. It's far easier to change something if you're aware of it and have some understanding of it in the first place, right? Self-awareness and Honesty with Oneself is the Catalyst for Change! Basically, your metabolism and metabolic rate is the speed at which your body digests, absorbs, distributes and burns calories. If your body has a slow metabolic rate it performs these processes rather slowly and will tend to put weight on rather easily. This in turn will make it very difficult to lose weight. If we go to the other end of the scale and look at a fast metabolism or faster metabolic rate, the opposite occurs. Someone with a fast metabolism naturally digests, absorbs, distributes and burns calories much quicker than someone with a slow metabolism. Someone with a fast metabolism tends to be slim naturally and will find it harder to put weight on. These people are the type that most of us know who can seem to eat for their country but never seem to put on any weight? How lucky these people seem to be compared to those who struggle to lose weight? Speeding up your metabolic rate (metabolism) is a very effective and commonly used quick weight loss method. In fact, of all the quick weight loss diets around, this is probably one of the easiest and therefore possibly the most popular diet for losing weight in a relatively short time. I personally know a lady who has successfully lost a lot of weight applying this method and more importantly she has kept it off long-term. Not only that, but she has also been very happy and enjoyed all of her meals! Please also read understanding metabolism. Comfort eating is probably the most common reason that a person can become overweight. People that comfort eat are often unhappy for various reasons and eating simply makes them feel a bit happier. This is totally understandable of course because every single one of us comfort eats to a greater or lesser degree at some point. Unhappiness for any reason such as boredom, lack of confidence or lack of control in our lives are all reasons to eat to comfort our emotions. Unfortunately it usually results in eating too much of the 'wrong' types of foods and the pounds pile on! Without doubt, we are creatures of habit. We're all used to certain things in our lives and specific foods and drinks play a major part in those habits. Let's take a simple cup of tea or coffee as one example. How many cups of these beverages are consumed by the average man or woman per day do you think? Let's take a rough guess and say anywhere between 3-5 cups, and in many cases more. Sound about right? Multiply that by 1-3 spoons of sugar plus milk - which will more than likely be semi-skimmed at best and even full-fat for many - and I think you can start to see my point?! Excessive levels of fat and sugar are being consumed in a simple daily beverage on a regular basis for years and years over a person’s life time. Add to this other high-fat junk foods that are being consumed out of habit and it’s no wonder people are suffering from overweight problems and obesity. This is very important to realise, understand and always remember. The foods that you were fed while growing and developing have provided the building materials for your physical body to grow and develop. This started when you were in your Mother’s womb and your Mother was providing you with nutrients through her diet. You were then fed as a baby, during childhood and as a teenager and continued to consume foods to where you are now, whatever age that may be. Therefore, your body is built from the foods that you were brought up on and fed as a child and in your early teenage years of development too. This is the same for everyone. As a result, we all tend to crave the foods that we were built on – to a greater or lesser degree - because our body, taste buds and mental/emotional associations with these foods are programmed to expect them. Our whole-being is made from them and still wants them! It's as if we can't live without them. We are mentally and physically attached to these foods. We are emotionally dependent upon them and the thought of not eating them anymore is almost over-whelming to most of us. To a greater or lesser degree, we are addicted to food much in the same way as an alcoholic is to alcohol. Well I don't want to come across as boring in any way, but social eating can also be a bit of a problem for many that are desperately trying to lose weight. For many, social eating is the cause of being overweight in the first place and also the reason for not being able to lose it. Everywhere you go people are eating the very foods that you might be trying to give up? It can become very difficult and very tiring to keep having to explain yourself to well-meaning friends and family. I know, because I've been there many times myself! You just have to learn to be disciplined as best you can and stand your ground from outside pressure. Don't be tempted or swayed by other's influence, either at work, home or socialising. If I'm out I eat something as healthy as I can. I'm a vegetarian anyway so I can simply eat lots of vegetables and sweet potato fries which is all pretty healthy and relatively clean. Well this one goes back to 'mental & emotional associations' as we all love our food don't we. We can all be a bit greedy of course and that's fine in my opinion providing we eat healthy foods. It's one thing to be greedy with healthy foods and another thing entirely to be greedy with junk foods. Some of us are greedier than others, so if you're one of the greedy ones then it’s something that you'll have to become aware of and try to change over time. There can be any number of the previously discussed factors in play at any given time. Different people have different upbringings and experiences and each of us can therefore have a number of different reasons for being overweight and possibly finding it hard to lose it. A little bit of soul-searching is required here for many of you in order to make progress. On the other hand, there are many of you that will just get on and do what you feel you have to do to lose that weight! "Awareness and Honesty with Oneself is the Catalyst for Change"
Whatever your reasons for wanting to lose weight might be, the benefits of a quick weight loss diet, healthy diet plan or other type of diet plan can be of great benefit to your overall health and self-esteem. There's absolutely nothing wrong with being big of course providing you're happy with it? If you are happy then you probably wouldn't be here, so let's presume you're not happy for whatever reason. Below is a long list of the many benefits of being healthy and slim, or at least not overweight. Each is discussed in a little more detail further down. Small changes in your eating habits can lead to big changes in your health. What you eat now not only affects your everyday health, but also lays the foundation for years to come. This affects your quality of life today and also how long you might live. Our health is our most valuable commodity in life without doubt. Without health our lives are almost meaningless as it affects everything and everyone around us. People think nothing of spending good money on junk food, alcohol and cigarettes and yet the mention of 'health foods' is way beyond their budget? It's their money, their body and their choice which makes it fine. All I'm saying is, think about your body, you only have the one so look after it as best you can because it has to last a lifetime! Yes, healthy foods can be a little costly but try to see it as an investment instead of a tax. If you're very overweight you'll know all too well of the burden that carrying this excessive weight around can cause. It can be very difficult for obese people and even non-obese people to get around. Starting a quick weight loss diet or other diet and exercise routine can get those pounds off! As you become lighter and leaner you'll find getting around becomes easier. Little jobs that you might not be able to do now will likely become a pleasure. Stress on joints is another major problem that you may be experiencing if you're overweight? And, the heavier you are the more stress your joints will be subject to. The lower-back, hips, knees and ankle joints in particular, all suffer as a result of overweight problems and obesity. If you're experiencing joint pain and stiffness from being overweight then losing weight will undoubtedly benefit you in these areas. Osteoarthritis, particularly of the knees, is a common disorder for overweight people. The symptoms of osteoarthritis as well as its development can be greatly reduced if you can start to lose weight. Why not start a healthy diet plan or quick weight loss diet today to get those pounds off? The more weight you carry around the more taxing to your system it will be. Excess weight puts a strain on your whole body. If I were to carry a rucksack on my back full of weights and strap weights to my neck, stomach, arms and legs all weighing a combined weight of anything between two and five stone or more, I would soon become extremely tired. And, if I were to do this for years as many overweight people do, it would be very exhausting and physically detrimental to my entire physical being. My internal organs, particularly the heart and lungs would be doing overtime as are yours if you're overweight? Your heart and lungs will be under extreme pressure which is probably making you short of breath and very lethargic. A healthy, quick weight loss diet can help to reduce your weight and release the pressure on your whole body making you less lethargic and less breathless. If you're overweight because you've been eating junk foods for many years then it's likely that your internal system is full of toxins, fat deposits and mucus. These will be in and around your internal organs and your blood stream. Your blood stream is vital for your life as you're well aware I'm sure. Blood not only forms the vital substance for the transportation of oxygen and nutrients to every cell in our body, but it's also vital for carrying dead cells, toxins and impurities away from our body to be exited out of the system via the skin, urine and stool. It stands to reason therefore that an unclean blood supply is not good for our energy levels, while a clean and healthy blood supply can increase energy and vitality making us feel more alert and alive. A quick weight loss diet, healthy diet plan and gentle exercise routine can help to cleanse your system and your blood. As you lose weight and become healthier internally your blood supply will also become cleaner as we have already seen from our discussion above. This will manifest itself through your skin and hair as they begin to take on a healthier appearance. This is another one of the benefits that can be experienced when your body and blood become cleaner and healthier due to a decrease in toxins and fat, and an increase in nutrients through healthier, more natural foods. When you start to take control of your health and possible weight problem through a conscious dietary change, you will undoubtedly start to feel better about YOU, because YOU are starting to take control of YOUR life and potential destiny. This is a positive step in the right direction to self-belief, an increased self-esteem and a personal sense of achievement. If you lack confidence right now because of being overweight or for any other reason, then taking control of your situation now should help you to make that change to a healthier, happier, slimmer, more confident YOU! There's a long list of quick weight loss diets, methods and techniques available to you. All will be listed here in due course. I would just like to say to you right now, that I have personally practiced every single one at some point in my life, not to lose weight, but to get cleaner internally and healthier. It just so happened that I lost a lot of weight while on these diets which is why they're listed here. As previously mentioned, there are many different diets for losing weight both quickly and slowly so its a matter of personal choice as to what type of diet plan you're looking for. Have a good read of each one and see what ones are best suited for YOU before starting anything. Please keep coming back as this website will be updated very quickly. Speeding up your metabolism is a very effective and commonly used quick weight loss dietary approach. In fact, of all the quick weight loss diets around this is probably one of the easiest to implement long-term as it allows you to eat quite a bit. It just has to be pretty healthy food that's all. I personally know a lady who has successfully lost a lot of weight applying this method and more importantly she has kept it off! Not only that, but she has also told me that she's been very happy and enjoyed all of her meals throughout the entire process and still continues to do so today. The pictures included in the meal plans that follow further down were taken by her of her meals. Thanks Maria! To speed up your metabolism you have to stimulate the system. Stimulating the system with exercise is one approach that can certainly help a lot especially when combined with a quick weight loss diet of one type or another such as those listed here. To speed up your metabolic rate you're going to eat three main meals a day with two light snacks in-between. You will therefore be eating five times a day, so this first quick weight loss diet is ideal if you have a good appetite. Its approach is also to focus on eating better not less! It consists of a low-fat, high fibre diet that is also nutritious and satisfying. The size of the main meals is your choice though, taking into consideration that you need to eat three of them in total throughout the day with two light snacks in-between. So, if you aren't a big eater, then simply reduce the quantity of the meals to personal requirements. The approach here is to eat enough at each sitting to feel satisfied but by no means full up so you feel 'stuffed' as it were. This approach kicks the digestive system into gear and speeds up the metabolic processes. 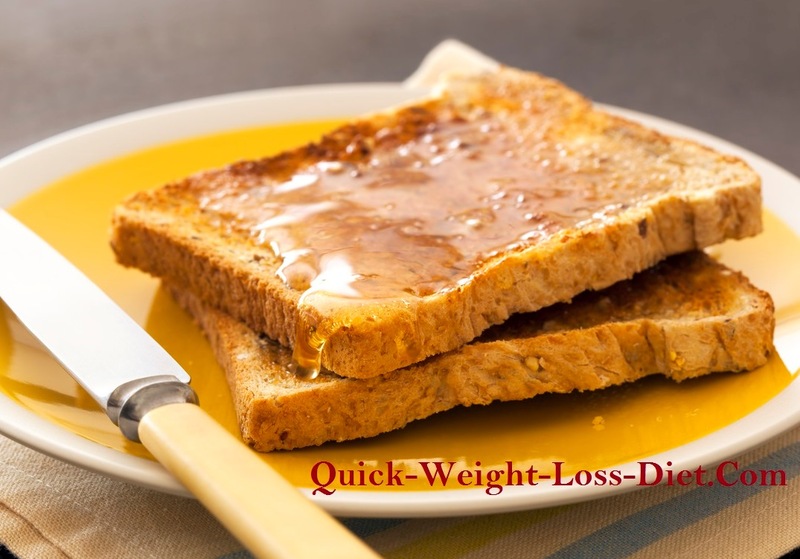 This quick weight loss diet also includes carbohydrates but not too much. In fact, any quick weight loss diet will have the carbohydrates greatly reduced and even removed completely in many cases as you'll find out with some of the other diets that I'll be uploading and sharing in time. For now though, lets concentrate on this first diet plan. 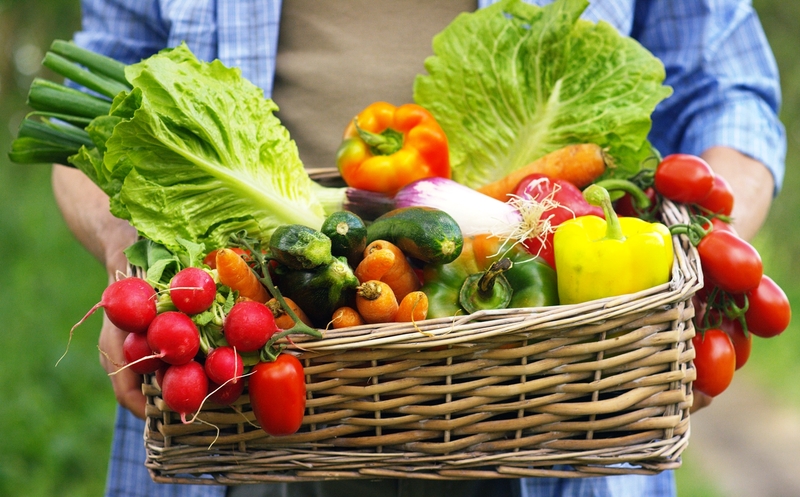 The whole point of this diet is to eat as close to natural food sources as far as possible. Read the ingredients list on foods that have one and avoid those with added sugar, unnatural flavourings, preservatives and colours. Generally speaking, eat low-fat varieties wherever possible. eggs - 2-3 per day maximum. Scrambled eggs are easiest to digest but poached are also good. Frying eggs hardens the protein and makes them hard to digest. Try to reduce your red meat intake as far as possible, it's bad for your arteries! Remember to drink plenty of fluids throughout the day to keep hydrated. Drink at least the recommended daily allowance of water which varies in different countries and from person to person. We really don't need to drink as much water in the UK as they do in Africa, and especially during different seasons such as the summer as opposed to the winter, that's pretty obvious. The recommended daily allowance varies between 1.5 litres to 2.7 litres per day for women and slightly higher for men. This all depends on how active you are and also what your diet is like, as training will definitely make you thirsty and certain foods will make you thirsty too. We could pick this to pieces in all honesty. My advice is to drink anywhere between 1.5 and 3 litres of water a day if you can. It you struggle with it, then you don't need it, simple. It should go down relatively easily. Listen to your body it will let you know what it needs. I will say this though; we are often dehydrated without realising it. If you feel a bit low then try to drink 2-3 glasses of water and see how you feel in about half an hour or so? This often does the trick for me which tells me I was indeed dehydrated! Alcohol should be reduced to a minimum or cut out altogether. Alcohol is not good for the liver but in small amounts it is considered acceptable. The recommended allowance as at 8th January 2016 for both men and women is to drink NO MORE than 14 units of alcohol per week. This is the equivalent to around six pints of an average strength beer or seven glasses of wine. You could therefore safely have a glass of wine every night of the week if you wanted to, but I am most certainly not suggesting that you do, that is your choice. Anyway, let's get to the meal plans for the first and easiest quick weight loss diet listed here. Gentle exercise is also encouraged such as walking, cycling and swimming. Do only what you feel comfortable with and don't push yourself too hard, allow yourself time to adjust. Note: These meal plans can be mixed up as you please. Simply choose any breakfast from any day to go with any lunch or evening meal from any other day. Day five has a variety of different breakfasts that can also be eaten on any day but they shouldn't be eaten every day. I would suggest 2-4 times per week and see how things go. This quick weight loss diet will work if you don't over-eat on the carbs. Weigh yourself before you start, if after seven days you haven't lost any weight or very little weight, then reduce your carbohydrates by say 25%. Carbohydrates are; potatoes, rice, pasta, bread and coucous. Quinoa is lighter in carbohydrate in comparison so it's not so bad. I'm not there with you so you have to do this on your own. Weigh yourself while naked every week first thing in the morning after going to the toilet and before breakfast. Make changes accordingly to these meal plans if need be as mentioned above regarding carbohydrates. OK, let's get started! High fibre cereal with live yogurt and fresh fruit. Eat enough to feel satisfied! 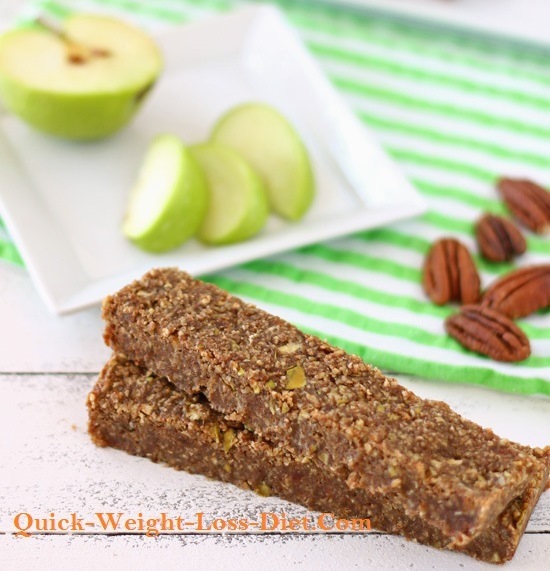 A high fibre, low fat, healthy fruit bar or piece of fruit such as an apple, a pear, a nectarine, a banana or something else. There's a variety of snacks that you can choose to eat in between your main meals. Go for high-fibre low-fat options only. There are many fruit bars that fit this description in health food shops as well as most main supermarkets too. Look on the ingredients list and avoid any with 'added sugar', unnatural colourings, flavourings and preservatives of any kind whatsoever. 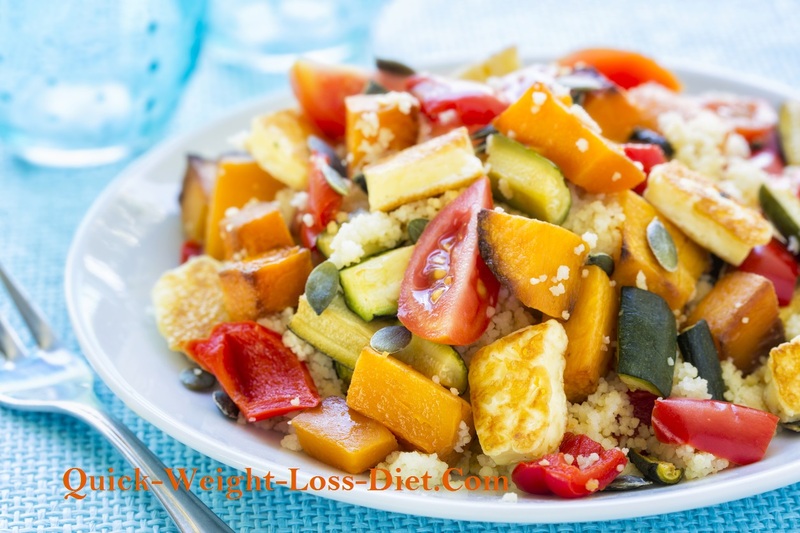 Couscous with lots of veg for that important roughage. Make your own and take it to work it's cheaper than buying it off the shelf. Add bell peppers, butternut squash, courgettes, tomatoes and tofu as seen here, or make your own version with different vegetables and tuna or other fish. Fresh fruit or fruit smoothies make excellent healthy snacks as fruit is full of antioxidants and fibre. Antioxidants are vital for combating free radicals thus helping to keep us healthy and free from disease. Fibre is also an important part of our diet to help keep our colons healthy and working efficiently. 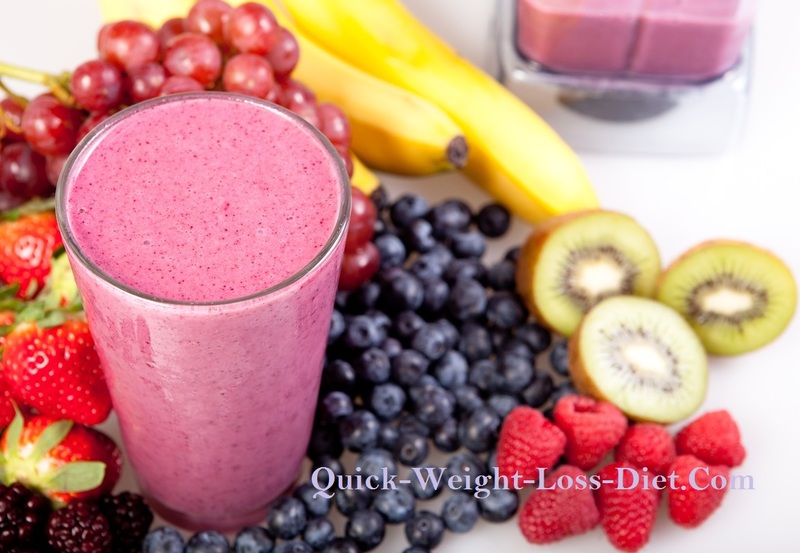 In fact, fruit or vegetable smoothies are the ideal quick weight loss foods. Be careful with bananas though, as they're very starchy and can be constipating for some people, they are for me! Adding avocados makes a smoothie creamy while adding one or two medjool dates to the mix makes it sweet. Mix it up and see what works for you. 3-5 medjool dates - make sure you remove the stones! If I need more fluid I add good quality, shop bought apple and mango juice. Wow, this smoothie is sweet and creamy and my kids and I wallop this down our throats. Love it! Sea bass with king prawns, sweet potato wedges, green beans, asparagus and carrots. You can use any fish and any vegetables you choose to of course. No batter of any kind though even so-called healthy bread crumbs. Always try to eat as cleanly and as close to any food's natural state wherever possible and don't overdo it on the carbs as they can be fattening! Remember to drink plenty of fluids throughout the day to keep hydrated. 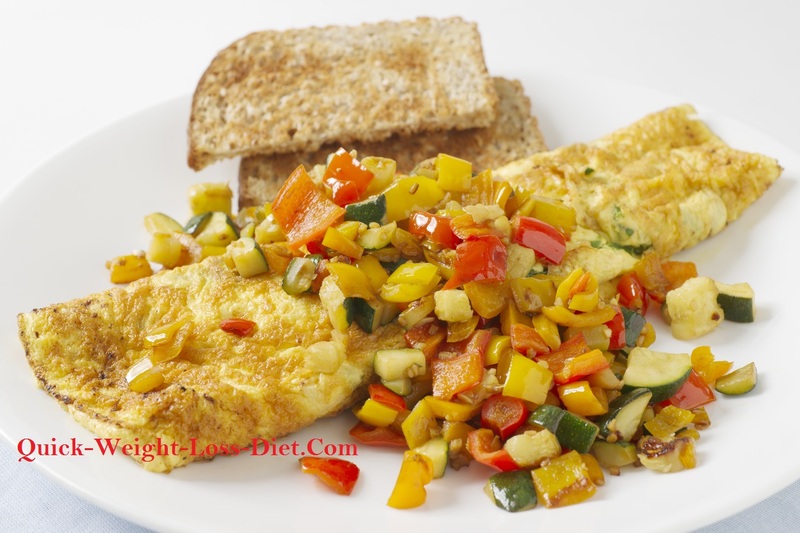 An omelette with vegetables and wholemeal toast. Add margarine or a low-fat non-dairy spread if you wish. Drink coffee or tea with full-skimmed milk or black but try to keep the sugar down as much as possible. Alternatively, have a glass of fresh orange juice or other juice. Fresh fruit is full of antioxidants and essential fibre which are both important for any quick weight loss diet. It's simple, healthy and satisfying and should leave enough room for your lunch! It doesn't have to be chopped or mixed though. Simply eat one or two of your favourite fruits. Pears, apples, plums, nectarines whatever you fancy is perfect when it comes to fruit! Bananas are the ideal snack too but are a bit starchy and constipating for some people plus they can be rather filling too, so just the one and preferably very ripe for easy digestion. Tofu and vegetables for a bit of Oriental! I love vegetarian Chinese food. Add some wholegrain rice or noodles if you want to. This could also be a mid-afternoon snack as it is here without rice or noodles? 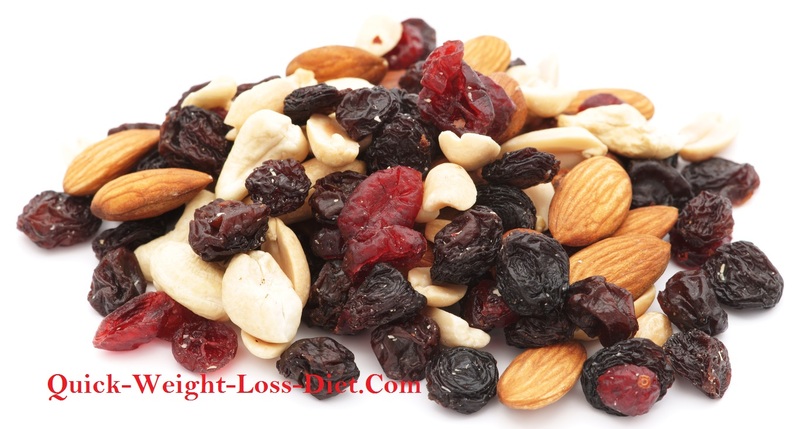 A couple of handfuls of mixed fruit and nuts. Add some seeds like pumpkin or sunflower if you want to. Cashew nuts can be rather fattening though so keep them to a minimum. 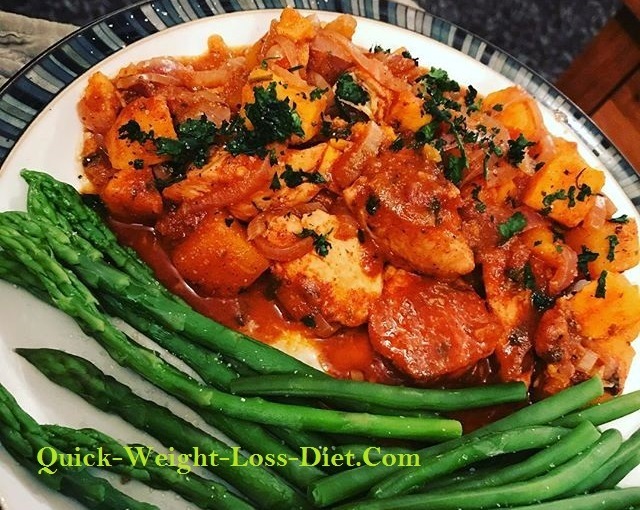 Chicken, sweet potato, butternut squash, lemon tagine with asparagus and green beans, Wow! 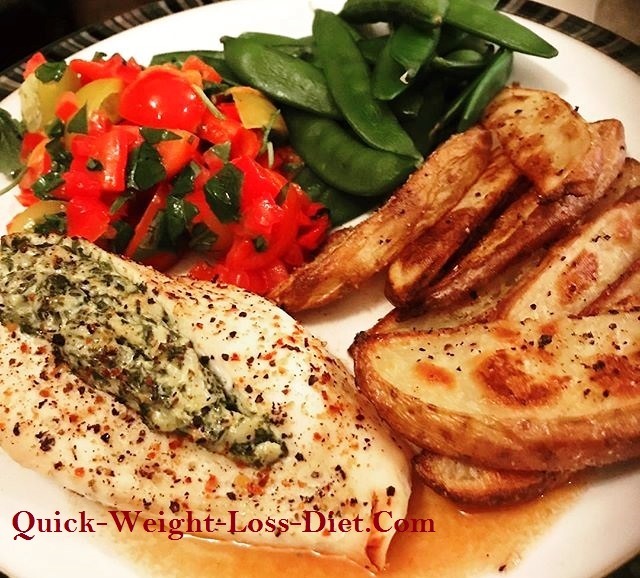 This type of food is perfect for a quick weight loss diet. It's high fibre, nutritious, filling and mildly laxative. Quorn chicken makes a healthier vegetarian option too. Yum! 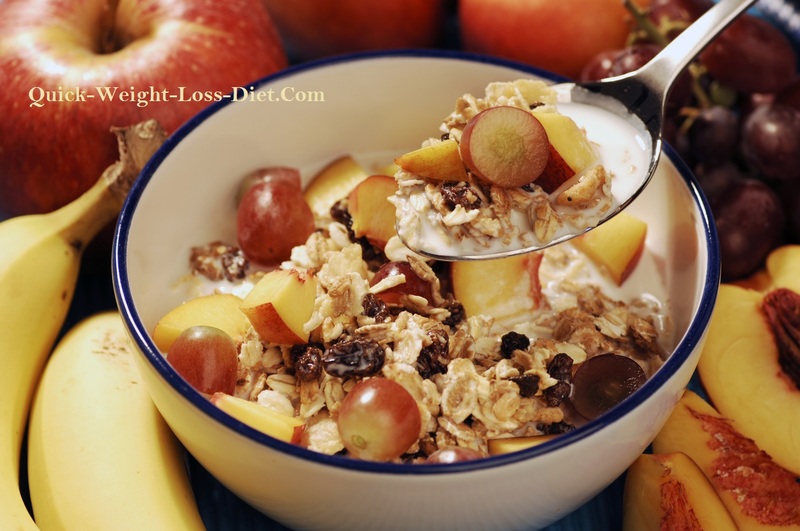 High fibre cereal or muesli with chopped fruit, perfect! Rice cakes make an ideal quick snack. They're light, convenient and come in a variety of different types. Some have added seeds too which is great for extra nutrition and fibre. They're also vegetarian and vegan friendly, Fantastic! They're very low in fat and typically have no artificial colours, flavours or preservatives, which is a bonus. They are high in carbohydrate though so don't pig out too much. 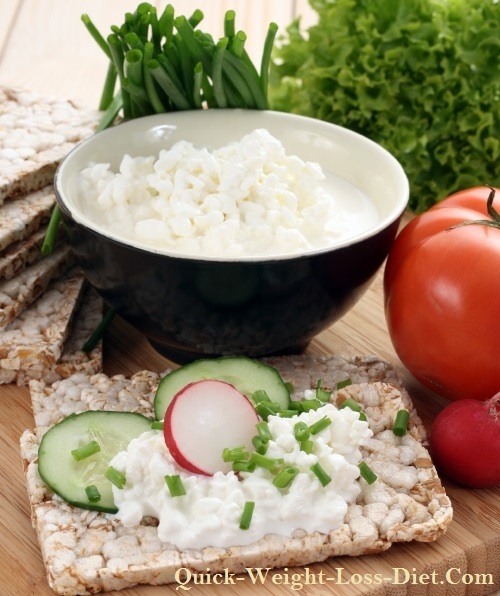 Add low-fat cottage cheese and as much salad vegetables that you fancy. Or how about some low-fat or fat-free fromage frais topped with slices of fresh peach, chopped strawberries or kiwis? Sounds good to me, right? Some do contain added sugar though so try for those without if possible, but I wouldn't worry too much if you've been actively watching your sugar intake up until now. Do remember to leave yourself a little peckish so you look forward to your lunch! 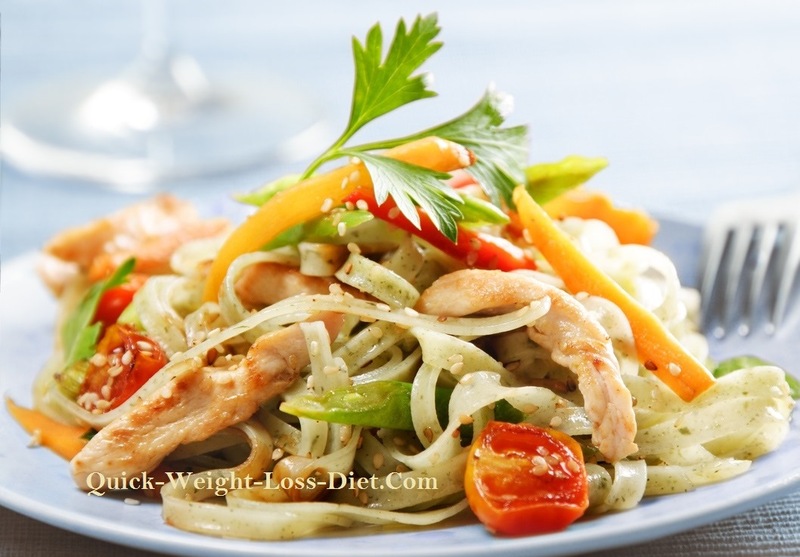 Chicken with noodles and vegetables. Use Quorn for a vegetarian alternative. 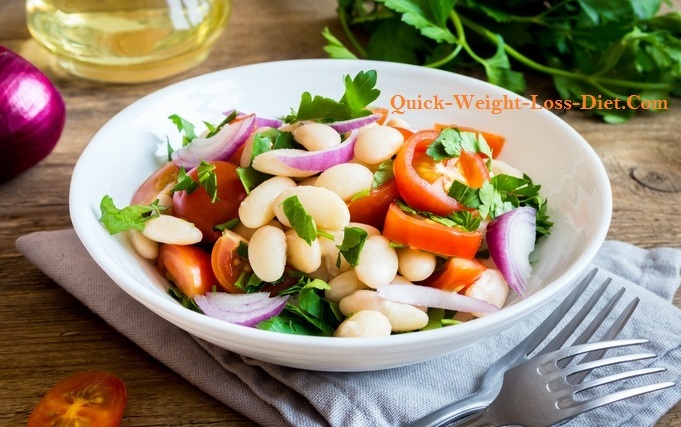 A simple light salad with any type of pulse such as chick peas, butter beans or cannellini beans as seen below. Add light soy sauce or any low-fat salad dressing that you fancy and don't forget to drink! A couple of pieces of any fresh fruits. As I've said before, bananas can be constipating for some people so go for the really ripe ones, but any soft fruits are ideal for a quick weight loss diet. All fruit is best eaten alone as it's a 'simple carbohydrate' so its digested quicker by the body than complex carbs like potatoes, rice and pasta. Fresh fruit is perfect for some quick energy when needed! For me, the best soft fruits are; nectarines, peaches, strawberries and my absolute favourite, mangoes. When you get a really ripe, dark orange flesh mango there's nothing quite like it, really there isn't! Go for the ones with all green skin, they have the darkest orange flesh, wonderful! 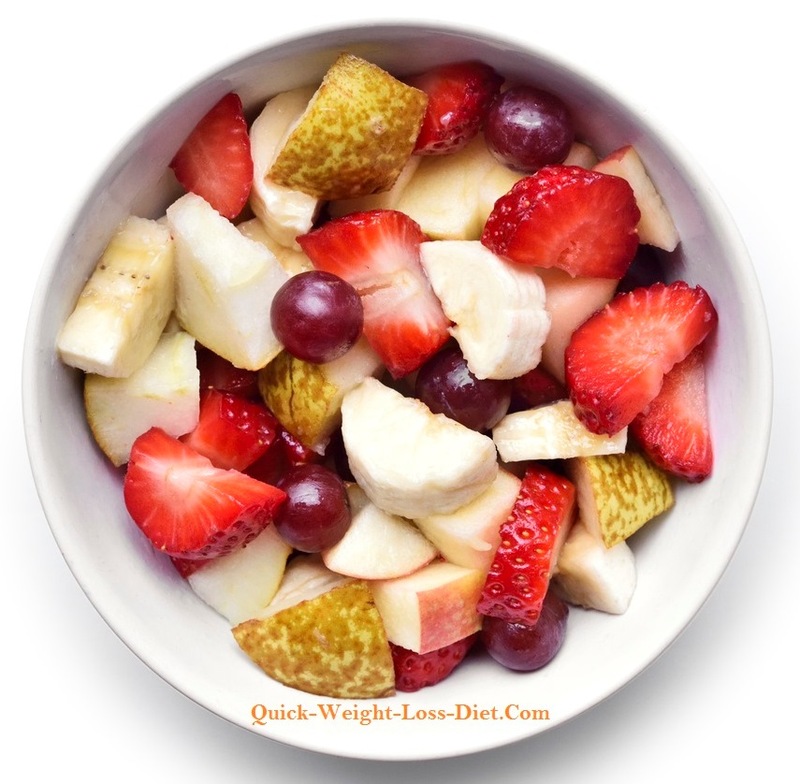 Soft Fresh Fruits are Perfect for Quick Weight Loss! 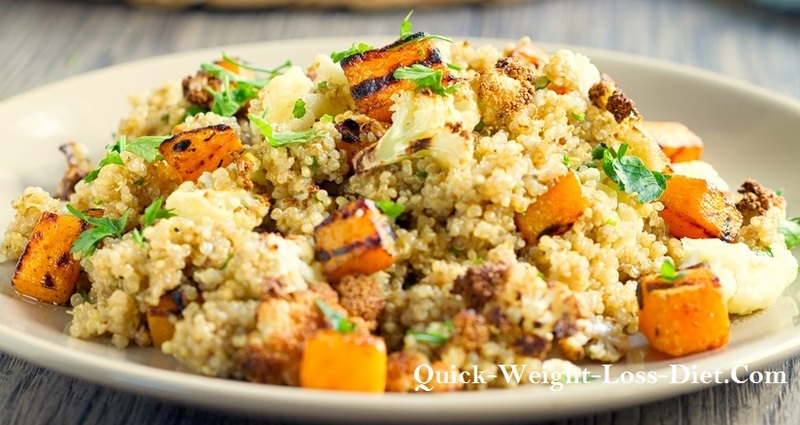 Quinoa with roasted butternut squash and cauliflower. 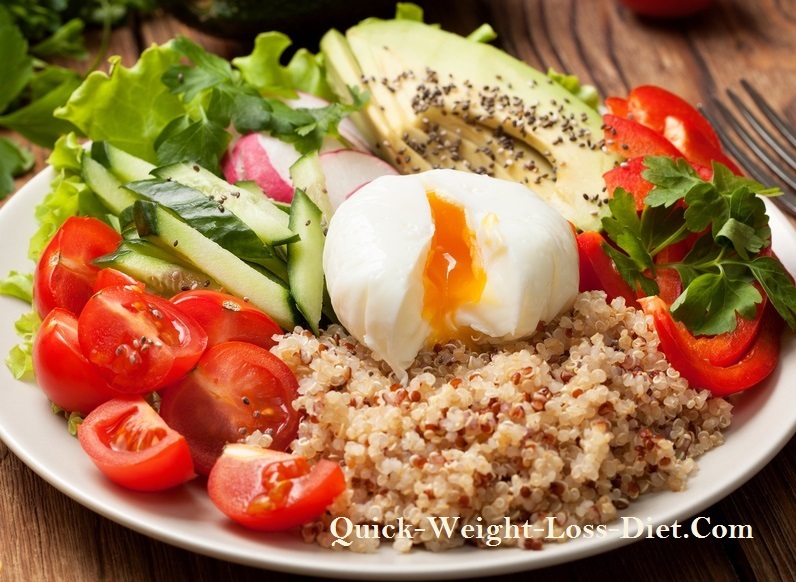 Quinoa is another ideal food for a quick weight loss diet. It's light and easily digested and can be mixed with any pulses and salad. Add more vegetables if you're hungry. In the UK, quinoa and couscous can be bought off the shelf already prepared in little plastic tubs, but its much cheaper to make your own! Back to rice cakes but this time with a slightly more filling topping. Tuna and salad on one or two rice cakes should certainly fill you up, but make sure you leave enough room for your evening meal! 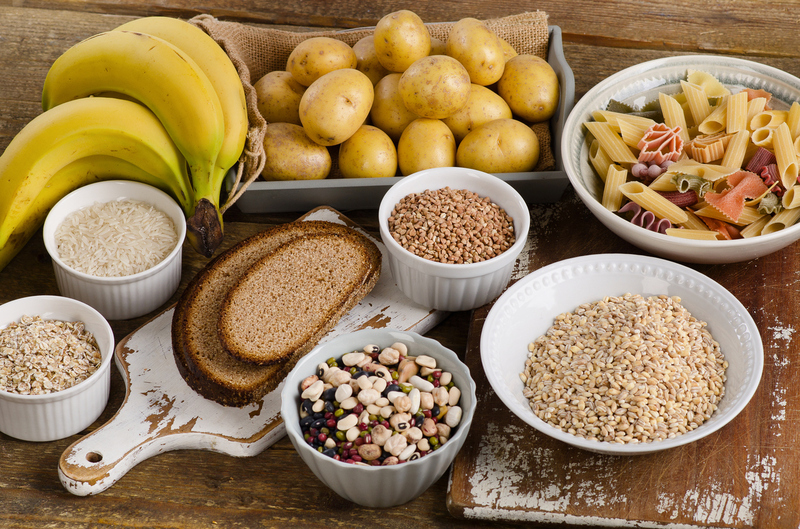 If you're struggling to eat everything here then reduce the quantities at each meal slightly, especially the carbohydrates like wedges, rice, couscous, quinoa, crisp breads and toast. Remember to drink plenty of water too. Scrambled eggs on toast? Not a classic for the Americans but us Brits love it! 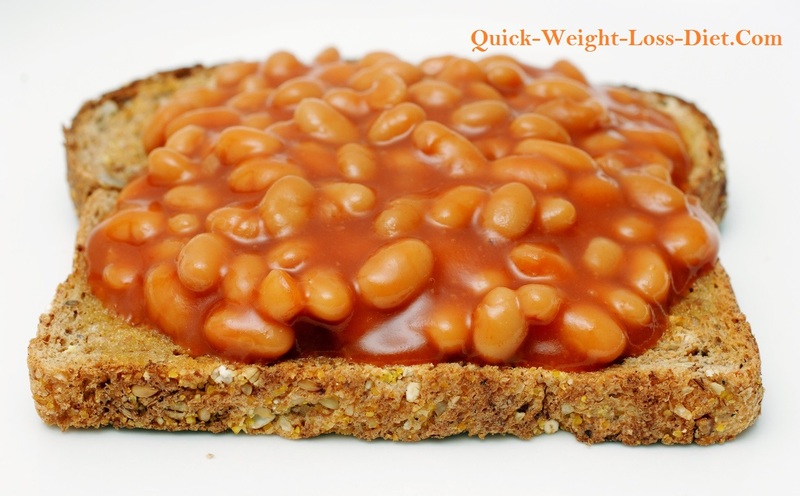 Or how about beans on toast?? OK, now I can hear the Americans going "what! Are you crazy man, what is this sxxt?!" Us Brits love it! It's filling, nutritious and full of fibre! But there's a healthy cooked breakfast here that you Americans will like too, I hope, fingers crossed! Take a look further down. Now, as far as I'm aware, Americans, as well as many European countries love waffles especially at breakfast? Am I right? I hope so. 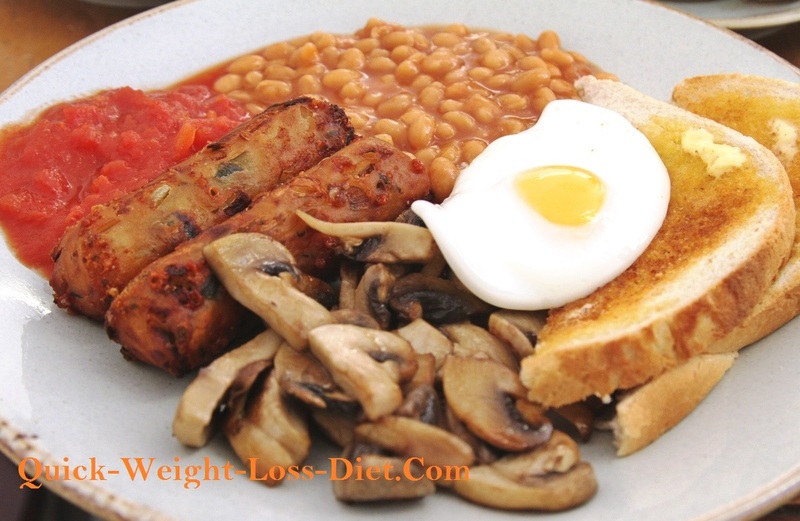 Now please remember this is supposed to be a quick weight loss diet so we shouldn't go overboard here, but it is OK to have a cooked breakfast two or three times a week if you fancy it. I'm a veggie so you wouldn't get me eating bacon anyway, but this is for those of you who might be struggling a bit with this quick weight loss diet and some of its meal plans, enjoy! Frying eggs hardens the protein making them harder to digest, so poached eggs are the better option and more suitable for what we're trying to achieve here. Below is a veggie option for those who are trying to cut down on the meat and thinking about a vegetarian diet. I wouldn't advise anyone to eat a meat sausage anyway though as they really are full of fat and this is supposed to be a quick weight loss diet after all? And yes, I know I said you should only eat wholemeal bread but white is OK once a week or so. 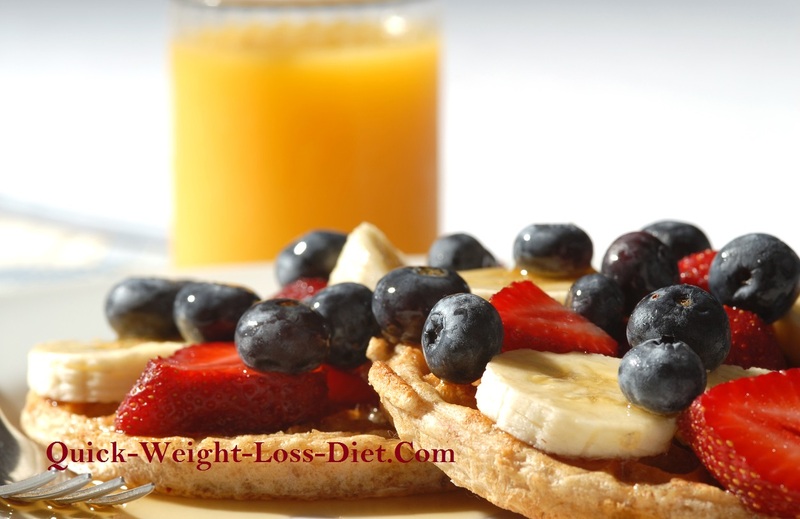 Or how about a healthier waffle breakfast with fruit? Add a dollop of crème fresh or fromage frais and you're good to go! 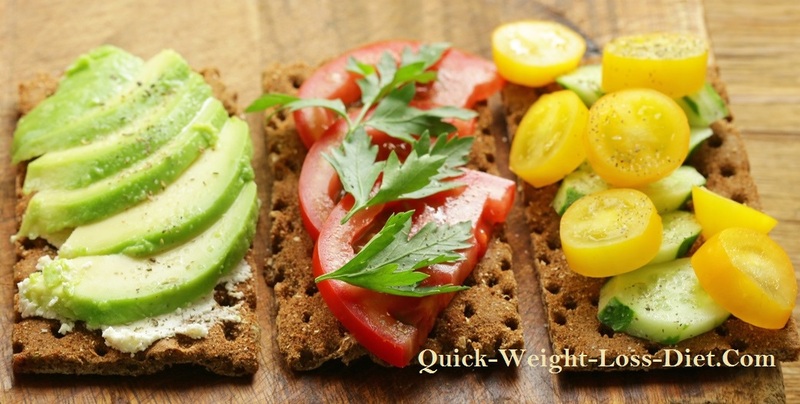 Simple, tasty and healthy, various grain crisp breads are favourites among health advocates. With lots of salad vegetables they provide plenty of roughage so they're great for our quick weight loss diet. Avocados and tomatoes are great together too with avocados providing some healthy fats. Cream cheese is not too bad in very small amounts, but you're better off with low-fat cottage cheese instead. Two or three of these can be quite filling so go easy as you need to leave room for your lunch! Quinoa salad with avocado, plenty of roughage here! Include an egg or not, or add salmon or other fish. 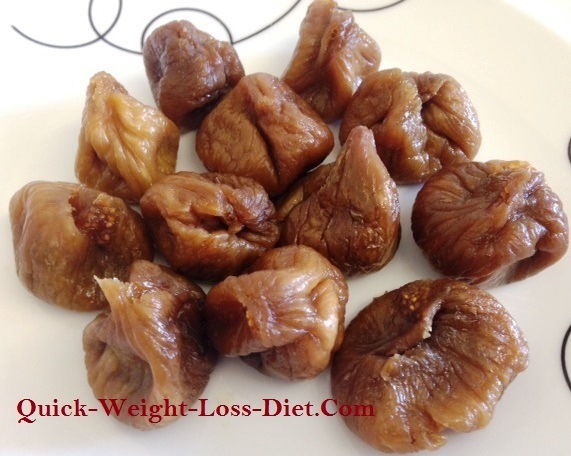 The laxative effect of stewed figs makes them ideal for a quick weight loss diet, but they can be rather filling especially when quite a lot is being eaten throughout the day, so don't fill up too much at each meal. 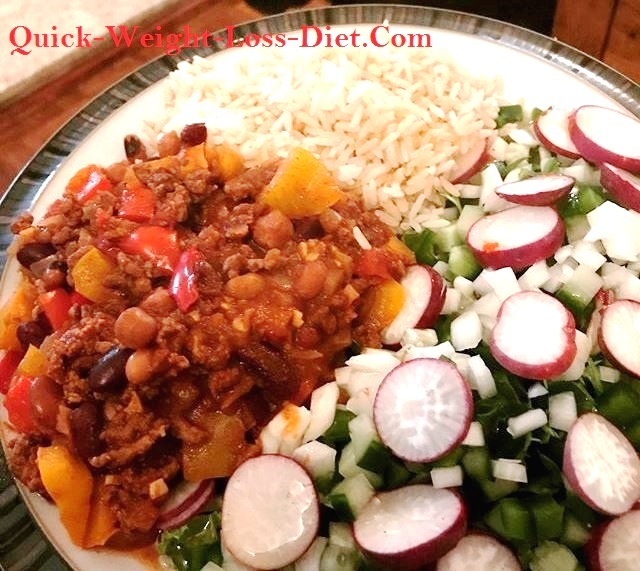 Chili con carne with rice and a chopped salad of cucumber, onion and radish. Ideally, try to use wholegrain brown rice for the extra fibre and nutritional value. Quorn mince or similar can also be used for a healthier vegetarian option. Eating more of the foods in this picture than your body uses for fuel will stop you from losing weight. In fact, a diet high in these foods will undoubtedly turn to fat unless you are a very active individual such as a long-distance runner! Drawing from our quick weight loss tip #2 reducing your carbohydrates and even cutting them out completely for short periods of time forms an excellent quick weight loss diet to help you to get slim and trim in no time at all. Drastically reducing carbohydrates in your diet aims to get your body into a state of 'ketosis' so that the body's energy comes from surplus body fat and any fats in your diet rather than from glycogen that's formed from carbohydrates. Your liver starts to break down fat too, and that process creates 'ketones' which become your new source of energy. Basically speaking, your body starts to burn its own fat reserves for fuel and energy as its regular energy supply in the form of glycogen from carbohydrates has been drastically reduced. This is what is commonly known as the 'ketogenic diet' and has been practiced by many for quick weight loss with very good results. My only problem with the 'true ketogenic diet' is that it encourages you to eat high levels of fat which in my personal opinion is not the healthiest of ways to lose weight. Yes you will lose weight on the ketogenic diet and pretty quickly too, but you will also be slowly furring up your arteries I believe with high levels of saturated fat, although much of the fat consumed on a true ketogenic diet is, or at least should be of the healthy type. For my version of a ketogenic diet please read on, or take a look at my article all about the standard ketogenic diet which also has lots of information on how to modify it for your personal needs, as well as for vegetarians too. Without realising it, I have practiced a 'modified ketogenic diet' on and off for most of my adult life from the age of about 26 years old until this very day. Yes, I did and do lose weight during these times, although I've never needed to lose weight so it never was and never is my aim, it just happens as a result of the diet. My point is, you don't have to eat lots of fat as encouraged on a 'regular ketogenic diet' for this type of diet to work. After all, the ketogenic diet is nothing more than a 'low-carb diet' that encourages the body to burn its own fat reserves for fuel. If you significantly reduce your carbohydrates and even cut them out on some days too, as well as practice some light aerobic exercise such as walking or cycling as discussed in the various exercises to burn fat, you will almost definitely lose weight quite quickly without having to consume large quantities of fat, which for many can be a bit too much. That's not to say that a 'true ketogenic diet' isn't a good thing though. In fact, the ketogenic diet in its true form has been used for treating various serious illnesses as well as being a powerful quick weight loss diet in its own right. My personal approach of what I call a 'modified ketogenic diet' is simply a low carbohydrate diet that focuses on healthy eating. This approach basically takes the previous quick weight loss diet of 'speeding up your metabolism' to another level. The previous diet plans for speeding up your metabolism are getting you to eat healthier. This is also preparing your body for the stricter quick weight loss diets that follow. This forms a systematic approach to a safe and permanent reduction in weight! This is important because none of us really know how we are going to react to a radical change of diet, especially if you've been eating junk foods most of your life and even more so the older you are. As I've said many times, and will continue to say many times whilst writing, when you start to eat a cleaner more natural diet your body will naturally start to cleanse itself internally. This in-built mechanism is our birth-right given to us by our creator and is a natural phenomenon of the natural world and our physical bodily existence on Earth. Please read about detoxification to understand more about this. Therefore, if you feel 'rough' when you start to eat less by reducing your dietary intake it is due to this detox process and not a result of being deficient in some way. 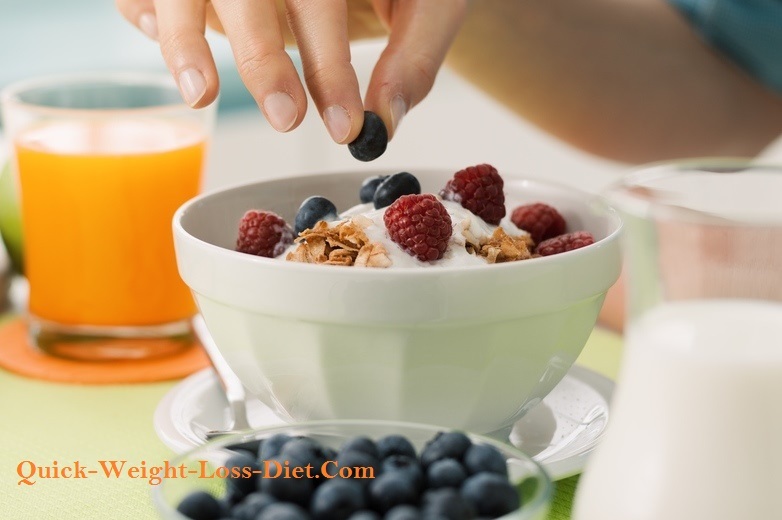 Yes, it is true that you can take these quick weight loss diets too far by staying on them too long which can be detrimental to your health and vitality, but, it is also true that people can feel very bad simply by missing their breakfast? This is a sure indicator that their body is not in a good state of health! If you miss breakfast and you feel bad then drink plenty of fluid such as water, juice and even black coffee with sugar if you want to. Then have a light lunch or something you're accustomed to with the inclination and desire to change your diet to a cleaner healthier one over time. Missing breakfast is in fact a short fast which will get you cleaner and healthier over time if you practice it regularly. I never eat breakfast and haven’t done so for longer than I can remember. My first meal is anytime between 12 midday and 2 pm. I then eat again around 6 pm. Having said that, and just to confuse things slightly, the first meal of the day is in fact breakfast whatever time it is eaten. Since your last meal of the day and during the night you are in fact fasting as you do not eat for around twelve hours. This is if you ate your last meal at 6 pm and you wake at 6 am the next morning. The first meal you eat after that time is breakfast because you are 'breaking the fast'. That is why it is called breakfast, 'break-fast'. There will be more on the subject of fasting specifically later on. Anyway, when we talk of breakfast here we are generally relating to most people's idea of breakfast which can be eaten anytime between waking up and let's say 11-11.30, especially on a Sunday? 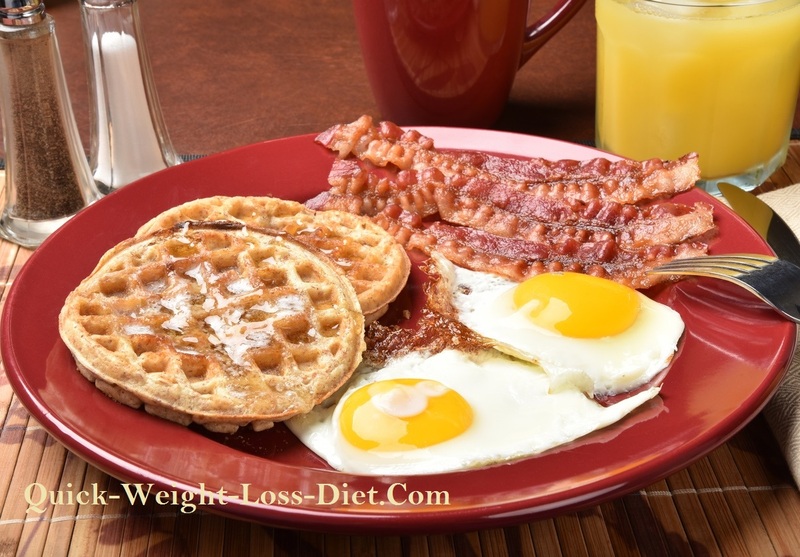 With this in mind missing breakfast is a sure indicator of your internal health and level of toxins. If you feel rough through missing breakfast you will almost definitely feel much better after eating. This is because as soon as you eat food the fast of the night is broken and the detoxification that your body was going through and that you were experiencing has stopped. It's a simple fact that many of us feel pretty rough upon waking and feel better after eating, sound familiar? I just wanted to touch this subject here as this diet and those that follow after are about reducing your dietary intake, so it's really a very sensible and good idea to understand your body and why it may be feeling a certain way during such times. You may be lucky and sail through without any detox symptoms at all. This all depends on your present diet, age and internal health. Your internal health will become clearer to you as you start to reduce your food with missing breakfast being the first step along with a reduction in your carbohydrates. This is simple enough really. If you've been eating a relatively healthy and clean diet consisting of natural foods that are as close to their natural state as possible then you're on the right track. These foods include the types of foods that are included in the first quick weight loss diet for speeding up your metabolism. Eating that way for at least one month or more will get you in the 'right condition' to start eating even stricter and cleaner as your body will have already done a bit of 'house clearance' even if you haven't noticed it, great! That is of course if you were eating poorly before that. If on the other hand you've been eating quite healthily and cleanly anyway for quite some time then you're already in pretty good shape to take it further. 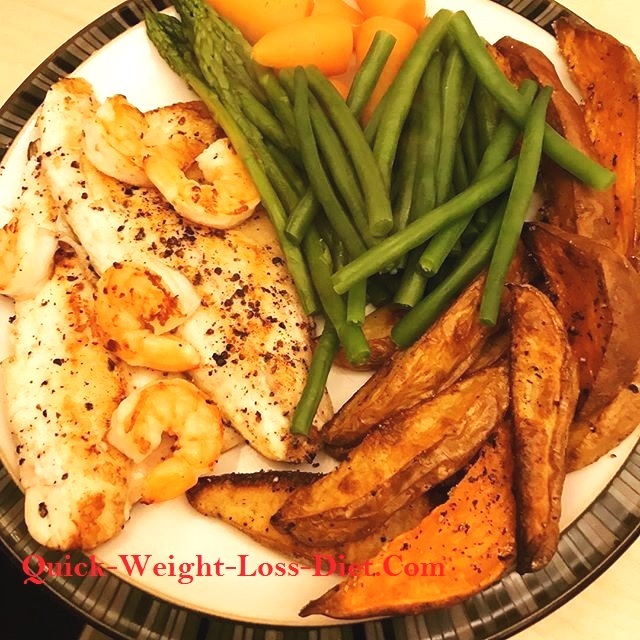 Taking the meal plans or meals made up from those foods included in quick weight loss diet #1 you can start to reduce the carbohydrates on your plate and replace them with fish, chicken and/or more vegetables. You can also eat vegetarian dishes if you don't eat meat or are trying to reduce it which is a great idea I think as I'm a veggie myself. The best way to do apply this quick weight loss diet is to introduce it slowly despite that being a contradiction. Have your normal breakfast or even reduce it slightly. After our discussion further up about breakfast you may even want to consider missing breakfast altogether and see how you feel? You can always eat something light if you feel bad for not eating breakfast. It also depends on how active your day is going to be and what time you wake up or get up? This is something you have to monitor yourself and play around with so you can adapt it to your lifestyle. A vegetable/cabbage soup diet could be considered a 'mono-diet' as only one type of food is eaten for a period of time, although a true 'mono-diet' would literally be eating only broccoli or cauliflower for example. 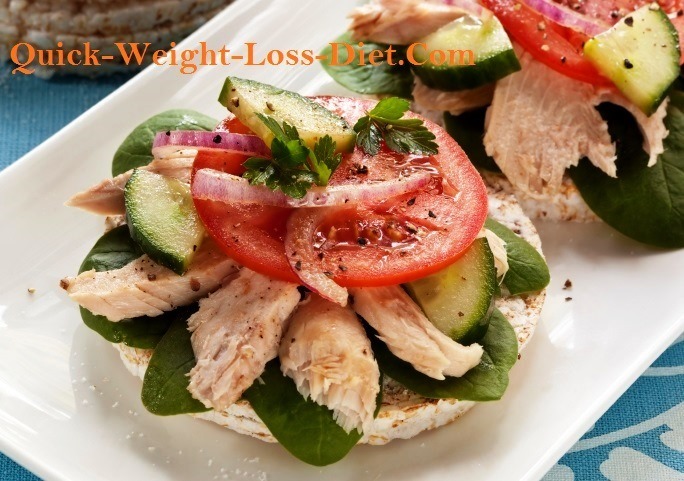 This quick weight loss diet is an almost certain method to lose weight quickly. This diet also acts as a mild detox as it flushes through the entire alimentary canal gently cleansing and nourishing as it goes. A vegetable soup diet is basically the same as quick weight loss diet #3 further down which is a vegetable only diet but a soup diet obviously contains more fluid because it's soup! Note: As I've said before, you need to monitor yourself on how you feel with all these diets and methods. I'm presuming you've been eating the previous diet (quick weight loss diet #1) or very similar, for at least a couple of weeks or more and you feel fine? If not, you should continue with that for another week or longer before starting this diet as this diet will start to cleanse deeper and may start to bring about some unpleasant detox symptoms. Please read about detoxification for more information on that. This is also discussed again further down in quick weight loss diet #3. 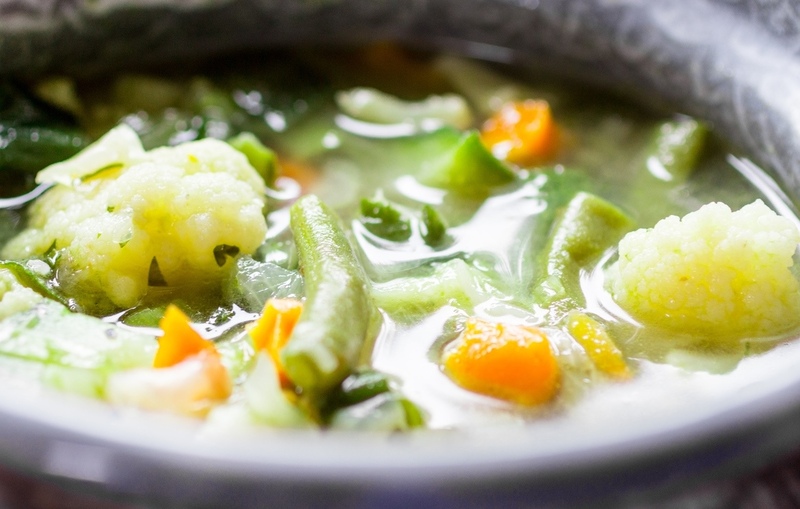 Eating only vegetable soup for a period of time will have a gentle laxative effect on the system. This is an important contributing factor to good general health and well-being as discussed in more depth on quick weight loss tip #3. Please take a look at what I've said there as it could have a very positive and profound effect on your overall health and potential life span! To make a gentle and easier transition you can just bring this soup diet into your meal plans for one or two days every week and see how you feel. This should be done when you're not that busy though so you're able to rest if need be. How Long Should The Soup Diet Last? This is something that you need to monitor yourself. As already mentioned above, simply bring this diet into your present 'healthy' diet and see how you feel. If you feel fine after a day or two then continue for another day or more. You can build up the time spent on the soup diet over a period of time by dropping back to your previous/existing diet for a period of time, say 3-5 days, before starting the soup diet again for another 2-3 days if you feel up to it. This intermittent approach between the soup diet and your regular 'healthy' diet is a safe and sure way to lose weight quite quickly over time. Generally speaking, you shouldn't go longer than around four or five days on the soup diet unless you've been practising it intermittently as described above over two months or more and you feel pretty good and confident about it. Over time, as you practice these quick weight loss diets more and more you'll get to know your body better and how long you can stay on them for. Most vegetables, but not root veg like parsnips, turnips, swedes and definitely no type of potato, sweet or white! They're too starchy and counteract what we're trying to do here which is a gentle flush of the system. Corn should also be left out for the same reason and no peas either. From the list of vegetables below you can make any combination by subtracting any vegetables that you want to. The vegetables you choose should be boiled really well so they're very soft for easy digestion and passage. You could also cook them in a slow cooker of course. Ideally you should peel vegetables like aubergine, courgettes and carrots before cooking to aid digestion. Add dried or fresh leaf herbs if you wish to add flavour. Make enough for the whole day or more days and store in the fridge so you don't have to keep making it. Eat as much as you want and when you feel like it. Blend the cooked veg so it's all one consistency if you want to. You can also add V8 if you can get it in your country to make things easier and more flavoursome. It does contain salt but if it helps you to stay on track then it's a positive. Incidentally, tomatoes are very cleansing to the system. I can remember Joan, the Mother of one of my best friends, making cabbage soup to lose weight over thirty years ago! She ate it and nothing else for about four or five days until she was fed up with it. It worked well she said, great! Eating only cabbage soup for five days or more is a well-known quick weight loss diet that's been around for decades and possibly centuries from other countries. The only difference between this and the vegetable soup diet above is how much you want to limit yourself by restricting certain vegetables? 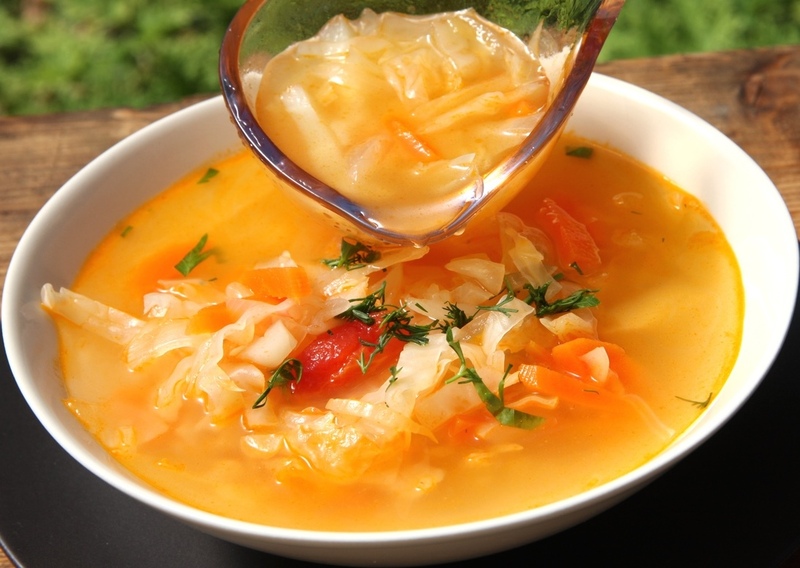 First timers should go with the vegetable soup above in my opinion and if you want to try a stricter, slightly more cleansing diet then try this basic cabbage soup for one or two days and see how you feel. There's nothing to stop you switching between the two if you feel the need, such as every other day or so? That will also add a bit of variety to make it a little less boring. Chop and boil the cabbage until soft and add the tomatoes afterwards if tinned or before if fresh. If you're adding any off the other vegetables then obviously cook them at the same time as the cabbage. There are no rules to cooking here, only that everything be very soft. As before, make enough for the whole day or more days and keep in the fridge so you don't have to keep making it. Eat as much as you want and when you feel like it. Blend the soup so it's all one consistency if you want to. A simple variation of the vegetable/cabbage soup diet above is a vegetable only diet. Like the soup diet, this diet could also be considered a 'mono-diet' as only one type of food is eaten for a period of time, namely vegetables! Taken from quick weight loss tip #4 this quick weight loss diet of only eating cooked and raw vegetables for a period of time is an excellent way to lose weight. Just like the soup diet above, eating only vegetables for a period of time will have a gentle laxative effect on the system which is an important aspect for good overall health and general well-being as discussed in more depth on quick weight loss tip #3. Please take a look at what I've said there as it could have a very positive and profound effect on your overall health and potential life span! Please also read about detoxification. This cleansing and laxative dietary approach will not only help you to lose weight quite quickly, but it will also have a gentle detoxifying effect on your system so it's a win win situation, great! Gentle Progress & How Long? How long to stay on this quick weight loss diet of vegetables is the same practice as that of vegetable and cabbage soup so please refer to the information there also. Note: It is very important here that you understand what I am saying. You have to realise that I do not know you or anything about you. Therefore, you have to monitor this by yourself. Many people will generally feel OK if they only eat vegetables for a day or two, but others can easily feel awful. The reason for this is because eating veg only for a day or two is cleansing to the system so a gentle detox is happening during this time. Please read about detoxification to understand why you might feel bad during such a time but do not let the information there put you off. Detoxification is a wonderful and powerful thing if implemented wisely. As previously mentioned, the way to proceed safely and effectively is to see all the quick weight loss diets on this page as progressive stages from a dietary perspective. 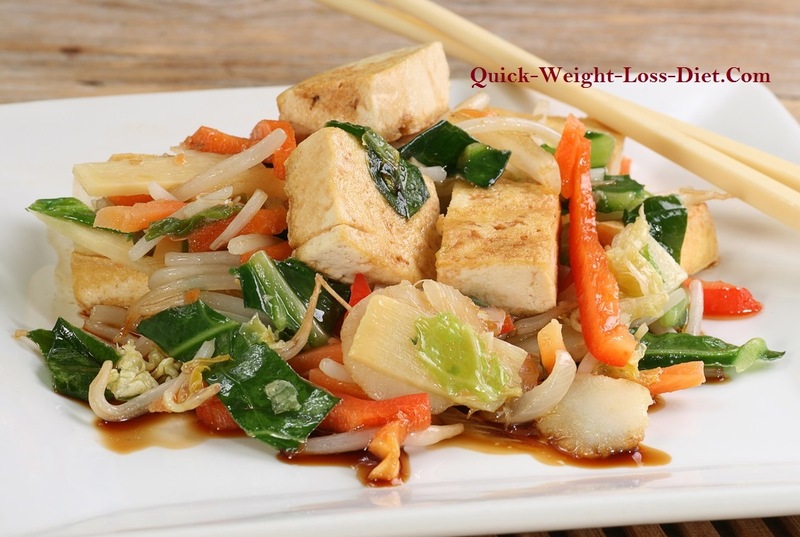 Each quick weight loss diet should therefore be applied in the order they are written on this page. This will ensure you are indeed ready for each stage physically. The vegetable soup diet further up and this vegetable diet are almost identical so they can both be applied together which will add some variation to help you through. How long you should stay at each stage depends on how you feel. If you feel awful at any point then drink plenty of fluid, vegetable juice, water or black coffee with some sugar, and if you still feel bad then drop back to the previous stage and eat something from there. Fruit juice, especially orange juice can be very cleansing, so if you feel a bit rough it will probably make you feel worse. Please read about detoxification first but do not let it put you off! If you feel generally OK after a day or two of eating only cooked vegetables then you can continue for another day or more if you feel up to it. Something else to also be aware of with eating only vegetables for a period of time is its laxative effect. This is also the purpose of quick weight loss tip number 3 which we now know is a good thing for reasons previously discussed. All salad vegetables such as; lettuce, cucumber, cress, radish, beetroot etc. 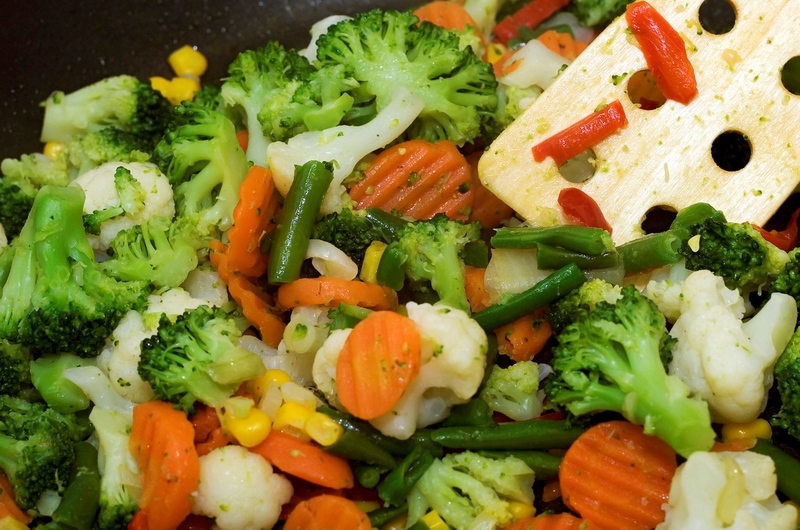 For me personally, I think cooked vegetables are far better for you as they are more gentle on the digestive system. Eating a raw carrot for example, I don't believe is good for us as it's relatively hard to digest compared to a baked or steamed carrot. Please understand, I am of the opinion that our digestive system is more closely related to the fruit eating monkeys such as an orangutan than that of a goat, horse or cow. We naturally eat fruit raw, but the same cannot be said for vegetables I think most would agree? This kind of makes sense really don't you think? Vegetables that I do eat raw are salad vegetables such as lettuce, cucumber, cress and tomatoes. All other vegetables I cook well either in the oven or steamed so they are soft. White potatoes are starchy and somewhat constipating to the system so they defeat the object of what we're trying to achieve here. Sweet potatoes are much less starchy and therefore better. They can be eaten but in moderation on this quick weight loss diet of only eating vegetables. If sweet potatoes are left out completely the calorie intake will be less and the mild detox is slightly more aggressive. We can use this to our advantage by slowing the detox down a bit by adding a well-cooked sweet potato if we start to feel a bit low during this time. Eating only vegetables for a period of time is a simple but very effective quick weight loss diet that will not only help you to lose weight quite quickly, but will also help to gently cleanse your system at the same time. This gentle detox also serves the purpose of preparing your body for deeper cleanses later on should you wish to start them. Such cleansing diets include; fruit diets and vegetable/fruit juice short fasts such as those discussed in the quick weight loss tips which will be included in more depth here soon so please come back! After some careful consideration, I've decided to list our liquid diet in two stages. This first stage consists of vegetable smoothies as they will be less cleansing to the system compared to fruit. This will help to make a transition from solids to liquids easier by giving your body more time to adjust, as well as give you more time to assess how you feel on such a diet. This is the best and safest approach to quick weight loss with liquid diets in mind. This is easy enough to do and should pose no problems, providing you have listened so far to what I've said about slowly changing your eating habits to a healthier and cleaner diet. Without seeming to keep repeating myself, but this is important, the way forward ideally is to cut out all red meat and only eat skinless chicken and fish. Eat only natural wholefoods that are as close to their raw, basic form as much as possible without additives and preservatives etc. Also, cut right down on all dairy produce including; milk, eggs, cheese, butter, yogurt and other related products. This is the best and safest way forward to prepare for quick weight loss using deeper cleansing liquid diets as discussed here. A Mediterranean diet is the ideal type of diet to start eating cleaner and healthier before starting liquid diets of any type. Eat plenty of fresh steamed vegetables or salad veg, not too much grain and/or carbohydrate along with some fresh fruit daily. Eat this way for at least 2-4 weeks and see how you feel. If you can go vegetarian all the better, but be aware, even some processed vegetarian foods are not particularly healthy, especially those that contain pastry like vegetarian pies and similar products which I do have illustrated on the vegetarian diet page. They are there for those that are thinking of going veggie to help make the transition to a vegetarian diet a little easier. Not everybody wants to eat super-healthy, especially when they're trying to give up something they've been accustomed to eating most of their lives?! This is simply a variation of our cabbage soup diet and vegetable diet further up. The difference is simply that the cooked vegetables are blended first and drunk as a liquid. Extra water can be added to the mix to make it slightly looser in consistency. 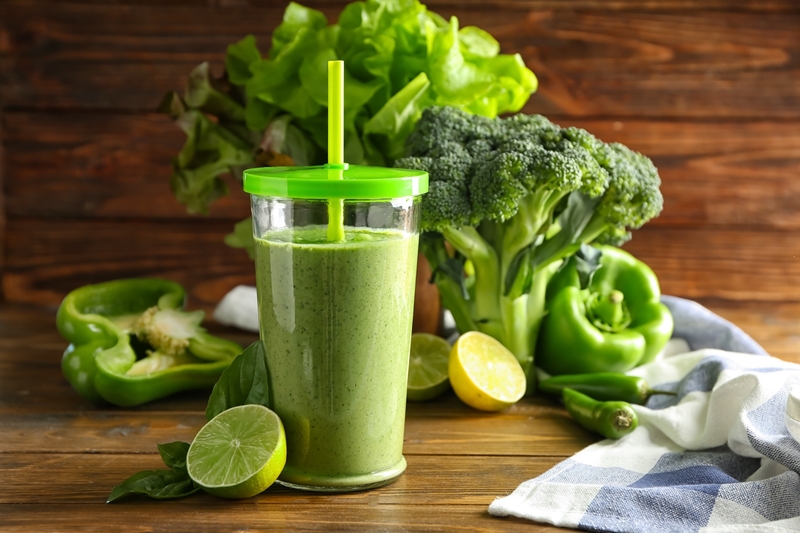 Vegetable smoothies take pressure off the digestive system and sweep through the entire alimentary canal, gently nourishing and cleansing as they go. They're a great way to get lots of vitamins and minerals without putting a strain on the system! 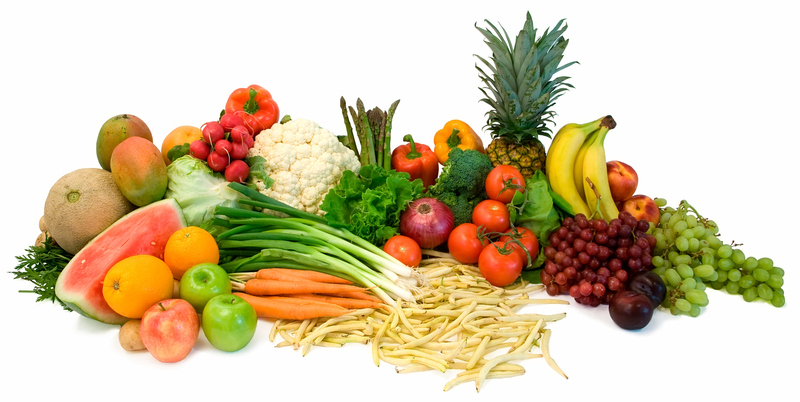 I personally believe that humans should not eat too many raw fibrous vegetables contrary to the picture above. We are not cows, sheep or goats. Our stomachs and digestive systems are not designed to cope with such hard to digest foods despite many believing that a raw-food diet is the way forward. Raw fruit yes, and some salad vegetables too, but I don't think we should be eating raw cauliflower, broccoli or even carrots! This is my opinion based on my personal experience and is appropriate for me. I have tried it and find that eating raw carrots for example often gives me mild stomach pains? Even Chinese medicine, that's been going thousands of years, says raw food is not good for the Spleen. This is another subject entirely but I thought I would throw it in here to offer some insight and raise some questions to this controversial subject. If you feel differently and love eating all manner of raw vegetables, then that's right for you and probably a good thing for you. Why not Cooked and Raw? You could always consume a mixture of both cooked and raw vegetable smoothies by alternating between the two during the day? Alternatively, you could have a raw day and a cooked day? Go with how you feel and trust your instincts, a lot of this stuff is trial and error and finding what's right for YOU. Hard vegetables will also need to be thoroughly cut into small pieces or grated first if you're making a raw vegetable smoothie. This is something else to consider as you don't want to burn-out your blender's motor do you? The same vegetables can be used as for the vegetable diet further up, but remember not to use starchy vegetables like potatoes, parsnips and even sweet potatoes should be avoided here. Butternut squash is OK but in moderation as it contains a bit too much carbohydrate, around 12g per 100g. Remember, this is the next stage on from the vegetable diet where sweet potatoes were permitted in moderation. This first stage of a liquid diet is the next level on where a slightly deeper cleansing takes place. This also prepares your body and you for the next level and the level after that, so you're able to slowly adjust mentally and physically to this quite disciplined dietary routine. This way offers a safe and systematic approach to quick weight loss and detoxification. Creating any combination from the list above for your personal taste, you can steam or boil the vegetables as the water will be added to the mix. Just add extra water to the blender if you prefer to steam your veg or use the water that created the steam. Steaming is better as it keeps a lot of the vitamins and minerals in the vegetables intact. Hard-boiling vegetables on the other hand tends to damage most of the vitamins and minerals and we want all we can get really. That said, the most important thing here is to create a laxative diet rather than a nutritious one. The importance of a laxative diet for health and weight loss is covered in quick weight loss tip #3 and again further down where it's even more important during stage 2 of this liquid diet. 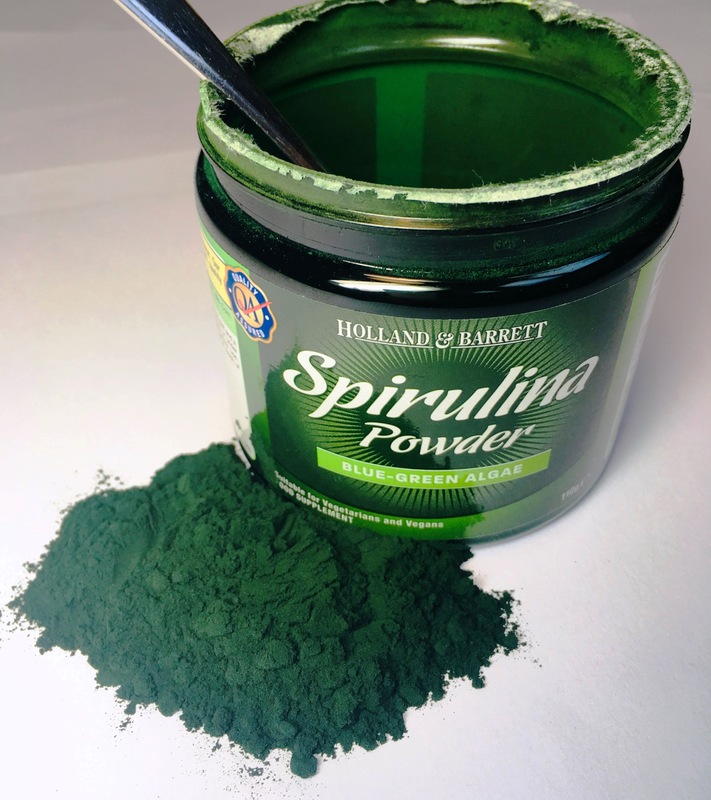 A great way to get some extra vitamins and minerals into the smoothies you consume is to add some super-food supplement powders such as spirulina, blue-green algae, wheat-grass, barley-grass and various seaweeds too. These powders are available in all health food stores and many supermarkets too with various combinations also made available. These natural 'super-food supplements' are high in nutrients so offer a great quick weight loss dietary supplement. They aid detoxification as well as overall health and well-being, so they can be very helpful during a time of internal cleansing and quick weight loss where energy levels can fluctuate and often diminish. Simply add a teaspoonful to your smoothie mix and you're good to go! Fruit smoothies can be introduced, but please understand that fruit is extremely cleansing. This can often bring about strong and sometimes unpleasant detox symptoms. In truth, these symptoms are something that you do have to go through to a greater or lesser degree, whether you're looking for quick weight loss or you just want to get cleaner and healthier on the inside. The thing is, it needs to be done systematically to allow your body time to adjust, which will also reduce the sometimes unpleasant detox symptoms. This approach should hopefully make the whole process as easy as possible. The thing to do is choose a day that you have little to do. Have a fruit smoothie in the morning if you want to and have vegetable smoothies for the rest of the day. I found that if I had fruit later in the day, say around 6 pm onward, I often had a very dream-disturbed night's sleep and woke up very tired. I also found some fruits were more cleansing than others such as citrus fruits like oranges and satsumas. 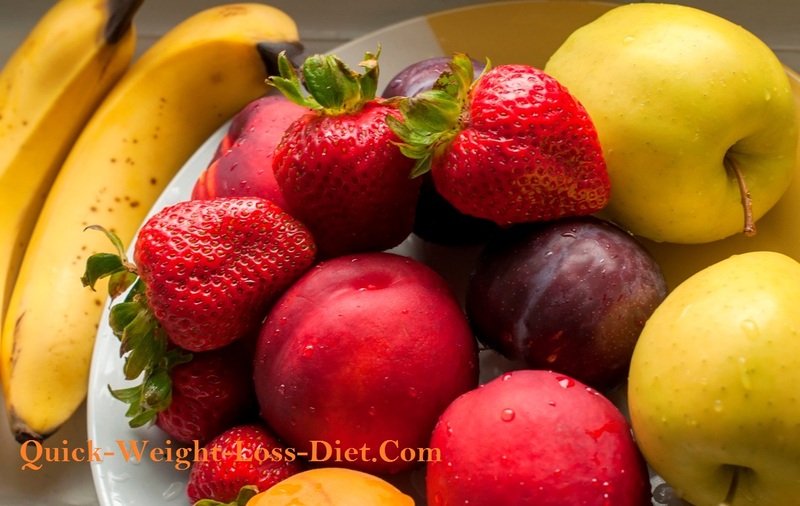 Other fresh fruits that I found very cleansing and often brought about strong detox-symptoms were kiwis, cherries, pineapples, peaches and nectarines. This is after I had already been gently cleansing the system with a vegetable only diet and vegetable smoothie diet for a number of days though. Just having a fruit smoothie while eating a regular diet would not make a difference. It wouldn't bring about any detox-symptoms because there is no real detox taking place while eating a regular diet. On the other hand, once you start to trigger detoxification by eating some form of a cleansing and restrictive diet such as vegetables only, after a few days your body starts to emit toxins and impurities into the bloodstream. If you then start to drink pure fruit smoothies it can be very disruptive to the system. This is because the toxins and impurities are loosened even more quickly by the very cleansing nature of the fruit, so stronger detox-symptoms will be experienced as a result. For this reason, it's a good idea to just have one fruit smoothie a day at most and have it early on in the day, either for breakfast or no later than 4 pm to reduce the possibility of a bad night's sleep! As I'm sure you know, you can purchase off the shelf smoothies now which can make life a lot easier by saving you time and hassle. Most of these are fruit only though so you'll still have to make your own vegetable versions. It'll be worth it in the end though, so stay focused on the goal ahead! The way to get started is to simply start making and drinking vegetable smoothies from breakfast time onward. Your first day should be a day that you're able to relax as it's very possible that you could feel tired at some point. It's also very possible that you might even feel more energetic? It all depends on your previous diet, your individual body and how you react to drinking only vegetable smoothies after a day or so. If possible, it might be a good thing if you could take a few days off to focus on this diet, or at least try to choose a time when you don't have a busy agenda. Don't allow yourself to get hungry while on this diet, so drink as much as you want whenever you feel remotely peckish. This is important as hunger can have a way of creeping up on you rather quickly and that's the time you can start looking at something else to eat, so be prepared! For this reason, and also for convenience of course, it's best to make up enough smoothie mixture first thing in the morning for the entire day. That way you'll have it to hand when you need it instantly. And, if you're running short, make more up before you run out! If you go out, take it in containers or any type of bottle, plastic or glass, so you have it to hand if you need it so you don't get caught out. Another thing to consider that can help you, is to try and stay away from all food temptations. I know this might not be possible as you may live with others, but I think you know what I'm saying here. Hopefully, any other members of your home, if you have any, will try to help and support you in your efforts to lose weight? If you're alone, then this should be easy? How Long to Stay on The Diet? Stay on this vegetable smoothie diet for as long as you can providing you feel OK. My advice however is no longer than 5 days if you can stretch that far, but only if you feel comfortable. Remember, you should have been eating a healthy Mediterranean type of diet for at least a few weeks or more. You should have also reduced all types of meat and dairy products too, and definitely no junk food at all for at least a couple of months (8 weeks), see the first quick weight loss tip! That way your body will have already started to cleanse itself if your diet was especially poor beforehand. This will help to reduce the symptoms of the mild detox you'll undergo during this diet, as much of it (detox) would have already taken place, albeit probably unnoticed by you, when a healthier eating routine was started. When you've completed your time on this diet of 2-5 days and you start to eat regular solid food again, try to keep eating as healthy as possible. This will provide a good base for you to practice a vegetable smoothie diet again in 2-3 weeks or so if you feel like it. This is a safe and systematic way to cleanse the entire system over a period of time, as well as prepare you for the deeper cleansing, liquid diet of stage 2 below which is an effective method for further detoxification as well as quick weight loss. This is more of a 'body system flush' than a diet but it certainly does the trick for quick weight loss too! Tread carefully though as flushing the system with this quick weight loss method can cause a lot of detox symptoms, even if you have prepared yourself for the occasion. Read about detoxification first so you have some idea of what to expect whether you're thinking of a liquid diet for health or quick weight loss. The way to proceed with this is the same as I've mentioned before. Slowly go through the previous quick weight loss diets on this home page in numerical order so you move through each method from the top of the page moving down. Spend a period of time on each one before moving on to the next. You may want to spend a few weeks or even months on each dietary method before moving on to the next. This allows your body time to adjust which is an important aspect of quick weight loss as you don't want to put too much strain on your body, as detoxification, which will naturally happen as a result of eating a cleaner diet, can be quite taxing on your energy and you as a result. Many people might then say, "well that isn't quick weight loss then is it, if you have to spend time on each stage?!" Well yes and no is my answer. The point is, once you've been eating a healthy, clean diet that consists of no red meat but only fish and chicken, plenty of vegetables, not too many carbohydrates like potatoes, rice and bread for quite a while of say anything between 3-6 weeks or more, you can then safely start to bring in the more restrictive diets such as soup diets and liquid diets for specific periods of time of anything from 2-5 days. This must all be done systematically though to ensure a relatively gradual and safe reduction in weight at first. There's still every chance you can lose weight quickly at first though, because once you simply change your diet from 'unhealthy' to 'healthy' the pounds generally tend to drop off quite quickly. This approach allows you to lose weight in the quickest time but in a safe way without too much strain on your energy reserves as detoxification takes energy, and, as I've said, you will enter a mild detox to a greater or lesser degree depending on many factors that are discussed in more depth on the detoxification page. The type of liquids you choose here should be based on three main things in this order. If you've read quick weight loss tip #3 you'll know why a laxative diet is an important one. Carrying waste away from the body quickly and effortlessly is one of the most important and beneficial contributing factors to good health. Likewise, constipation is one of the biggest contributing factors to poor colon health and overall health in general. This is never more important than when changing your diet to a healthier one where detoxification will be triggered. During such times, toxins and impurities will collect in the entire alimentary canal but more specifically the colon or large intestine where they need to be carried away as soon as possible. A laxative diet achieves exactly that as does a laxative liquid diet as discussed here. The importance of a laxative diet in general, for weight loss, and for detoxification in particular, is rarely mentioned if at all for the vast majority of the time. Its importance should take precedence over everything else regarding your choice of foods and liquids which is why it is number one and top of the list here. The thing to remember is, when you start a liquid diet you are basically starting a fast. It's a camouflaged fast in a way as a true fast is generally considered to be water only. A water fast can be dangerous though so forget that unless you're experienced and know exactly what you're doing, in which case you wouldn't be here reading this anyway. Prune juice is easy enough to acquire as you can buy it from most food store shelves, or you can utilize the prune juice that's in the cans of prunes that are also readily available on shelves. Go for prunes in apple juice or 'natural juice' though and not those in syrup. Fig juice or 'syrup of figs' is something I make-up myself. It's easy enough to do. Simply get a number of dried figs, anything from 10-20 and break them apart. Soak them in red or green grape juice in a container or large jug overnight in the fridge. Strain the juice from the figs the next day through a colander first, then a finer strainer such as a tea strainer or sieve to get rid of all the seeds etc. You can warm it up if you need to if you're in a colder climate. Apricot juice/syrup is created in exactly the same way as syrup of figs above. Go for unsulphured apricots which are brown in colour as opposed to the very pale more natural looking apricots. The pale apricots are indeed sulphured where 'sulphur dioxide' is used to preserve the fruits and to keep their natural pale colour intact and supposedly more appealing. In the US its spelled 'sulfur' but us Brits for some reason or another love our silent and strange sounding P's? Sultana/raisin juice or syrup is another great syrup that you can easily create yourself the same way as for fig and apricot juice/syrup above. All these have a good laxative effect upon the system and are ideal juices and liquids for quick weight loss despite many probably thinking they are full of sugar and therefore fattening? More on that in a moment further down. Grape Juice is one of my all-time favourites, especially the red variety. I use this as a main off-the-shelf juice whether I'm fasting or not. It's great as a base for syrup of figs as previously mentioned and other dried fruit syrups too. Whenever I've been engaged in a long juice fast, this is one of my main juices where I'll use combinations of off-the-shelf pressed red grape juice for convenience, alongside home-made red and green grape juice to get those extra vitamins and energy required for those longer fasting periods. Apple Juice is an excellent liver stone softener. I know as I've used it for this purpose before a liver purge where the stones and gravel need to be softened before they're purged from the liver and gallbladder. I've also mixed apple juice with grape juice to use as a base for soaking figs, apricots and sultanas etc. Apart from making your own apple juice, it's best bought as 'pressed' where it has a cloudy appearance similar to the home-made version. Home-made from fresh fruit is of course the best quality with any juice, but making your own juices with a juicer takes time preparing and cleaning up afterwards which can put people off. Mango Juice is more of a puree than a juice due to the fruit's pulpy nature where little juice can actually be extracted from the fruit. Despite this, it's still generally labelled as 'juice'. Mango juice is also laxative in nature and therefore ideal for our quick weight loss, liquid diet. Apple and mango are a great juice-combination and can be readily bought from shop shelves as a result. I've used off-the-shelf pressed apple and mango juice many times during a detox diet, both as a base for soaking dried fruit as well as to drink straight from the carton which I love. Mango is my favourite fruit hands-down! Carrot juice is also laxative which makes it ideal for our very cleansing, quick weight loss, liquid diet. Carrot juice can be purchased off the shelf in most supermarkets or you can make your own using a juicer. Although I like to keep fruits and vegetables separate due to their different speeds of digestion and assimilation by the body, whether I'm eating them or juicing them, carrot juice is one of those veggies that I make an exception for. Its most often mixed with apple juice which is a common combination that's seen on many health food and supermarket shelves as a result. Carrot juice can obviously be mixed with all manner of other vegetable juices of your choice too. Common combinations include; 'carrot and beetroot', 'carrot, apple and celery', 'carrot, apple and spinach', 'carrot, apple and kale' to name but a few. Experiment and make up your own juice-combos with carrot as the main base juice ingredient for that gentle laxative effect! What about Sugar & Calories Though? I mentioned further up about some people possibly thinking that these high-fruit sugar juices and syrups can actually be fattening to the body and will therefore have the opposite effect of quick weight loss or any weight loss at all? Remember, you'll be flushing the system with this method and you will not be taking in any solid food at all. During this time your body will be cleansing and ridding itself of toxins and impurities. You will not gain weight during this time even if you are drinking high-sugar drinks, as that sugar is naturally occurring fruit-sugar known as 'fructose'. This fructose will be burnt up by the body and used for fuel during its house-cleaning process. 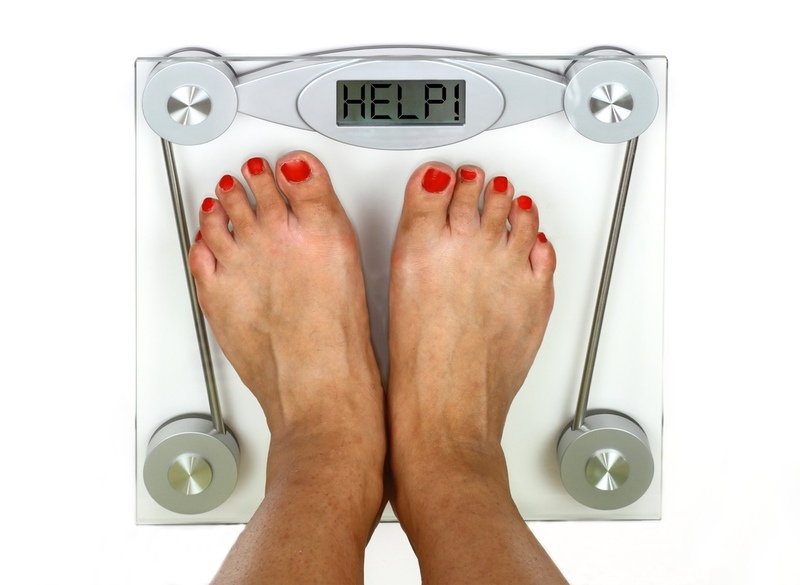 During this time you will almost definitely lose weight, the question is, how much? That will be revealed once you get started! Note: If you're diabetic, then you will of course need to assess all sugar intake you consume. I'm afraid I will have to leave that up to you to work out for yourself which you will probably have no problem doing if you're accustomed to a diabetic lifestyle. You'll be better to go with low-sugar vegetable juices I believe, but please don't take my word for it. Please talk with your healthcare professional about this. Over short periods of time, the nutrient density of the juices and liquids you consume is not as important as their laxative effect. The reason for this is because the main purpose here is to gently flush the system, carry away toxins and impurities, and lose weight quickly and safely over a period of say 2-5 days. After this time, a normal, albeit a cleaner and healthier diet is resumed. Meaning, once you've spent a few days or more on a laxative, liquid-only-diet, you then go back to eating a clean and healthy diet. You can then repeat the process once again after maybe one or two weeks if you feel up to it. This is a sure quick weight loss method that's similar to 'intermittent fasting' but more gentle on the system. This gentle approach is more suited to those new to the whole idea of cleansing, flushing and detoxifying the system, whether for health of weight loss, fast or slow. Getting back, we therefore don't need to be concerned about nutrients as the body is more than capable of handling 2-5 days on a liquid only diet, providing it consists of a combination of the juices and syrups mentioned and advised further up (except for diabetics). This is especially so for those just starting out on this type of quick weight loss method. These juices and syrups will not only give you our desired laxative effect for reasons already discussed, but they'll also give you vital nutrients and energy during this potentially physically demanding time, which as mentioned, is a mild form of fasting known as a 'camouflaged fast'. Note: If a liquid only diet is continued for longer periods of time though, such as over 7 days or more for example, then there's a variety of things we can do to help us along the way to make sure we're getting enough vital nutrients. For now though, I'm only going to focus on shorter periods of time which is all we need to be concerned about for quick weight loss. This has never been something of great importance to me when starting any type of cleansing diet. The job at hand and the goal ahead has always been my priority. Fortunately, I like most of the juices and liquids that are consumed on a liquid diet, and I'm sure you probably will too as there's plenty to choose from, despite them all being the same thing, liquid! The reality is, apart from things like avocados, bananas and mangoes, you really can juice just about anything. As I've mentioned countless times, the importance of a laxative diet cannot be overstated during the process of detoxification and of quick weight loss, which will be the result, providing you have listened to everything I have said up until now regarding eating cleaner and cleaner over-time to eat yourself into the right physical condition to undergo deeper cleanses with stricter detox-diets such as this liquid only diet. That said, feel free to experiment with as many different juices and juice combinations as you want to, because as far as I'm aware, drawing from my many years of juicing experience for detoxification and deep cleansing of the system, most fruit and vegetable juices are laxative to a greater or lesser degree so you'll be fine. As with the smoothie diet, this quick weight loss approach can be started by simply drinking juice and home-made syrups from breakfast time onward. Your first day should be a day that you're able to relax for the same reasons as the smoothie diet so please read all about that as I don't want to keep repeating myself. A good approach for this pure liquid diet, if you think it's too strict, would be to alternate between the vegetable smoothie diet and this diet. You could have a day of vegetable smoothies followed by a day of fruit juices and/or home-made fruit syrup of some type from the list further up. Alternating between this diet and the smoothie diet is a good way to adjust mentally and physically to the strict nature of this type of restrictive diet. Again, don't allow yourself to get hungry so drink as much as you want whenever you want. The first day will probably be the hardest day as you will at times more than likely feel hungry, so just keep drinking and the hunger will pass. The second day should be much easier as the hunger should have disappeared as your digestive system closes down through the lack of solid food. If you feel overly hungry, then drink more juice, fig syrup or prune juice as these are rather filling. If the hunger persists then have a large vegetable smoothie. It's unlikely you'll feel hungry afterwards, but if you do, have another one! As with the smoothie diet, don't run out of juice and home-made syrups, and once again, if you go out take plenty with you so you have it to hand. You don't want to get caught out and find yourself reaching for something else to eat! 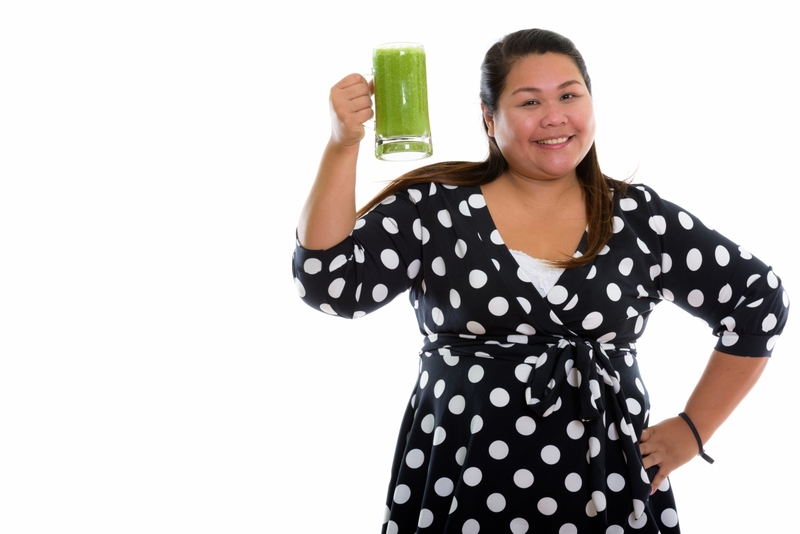 This quick weight loss, liquid diet should be similar in its duration as the vegetable smoothie diet. Whether you're alternating between vegetable smoothies and this stage 2 pure liquid diet, or you're only drinking pure liquids from this stage 2 approach, my advice is to stay on this diet for 2-5 days and no longer than 5 days. If you have any concerns during this time then you should start eating some well-cooked vegetables before going back to your normal diet, which I hope is a healthy one?! Don't forget to read about detoxification too. As with the smoothie diet, once you've completed your time on this diet of 2-5 days and you start to eat regular solid food again, try to keep eating as healthy as possible. This will keep the weight off as well as form a good physical base for you to practice this quick weight loss approach intermittently at various intervals of between 2-4 weeks if you choose to? This intermittent form of cleansing offers a safe and systematic approach to healthy and consistent quick weight loss until you find a natural and healthy weight that you're happy with. This allows you to lose weight quickly and safely while cleansing the body on the inside at the same time.